Everybody is enjoying their new home. 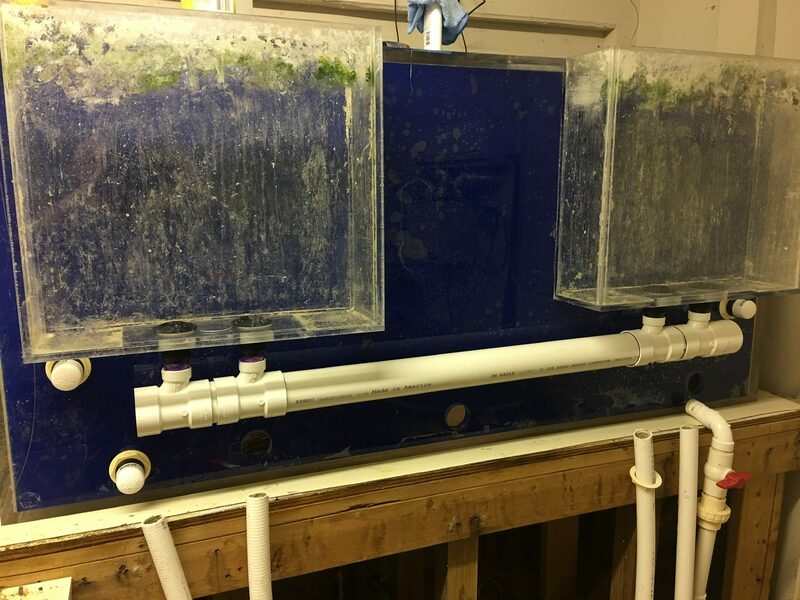 My DIY algae reactor is starting to take off. Chaetomorphia is starting to recover from no nutrients. I have a little hair algae in the main display. I’m hoping it begins to reced with the algae reactor competing against it. Next up is the setup of my invert/ frag quarantine tank. 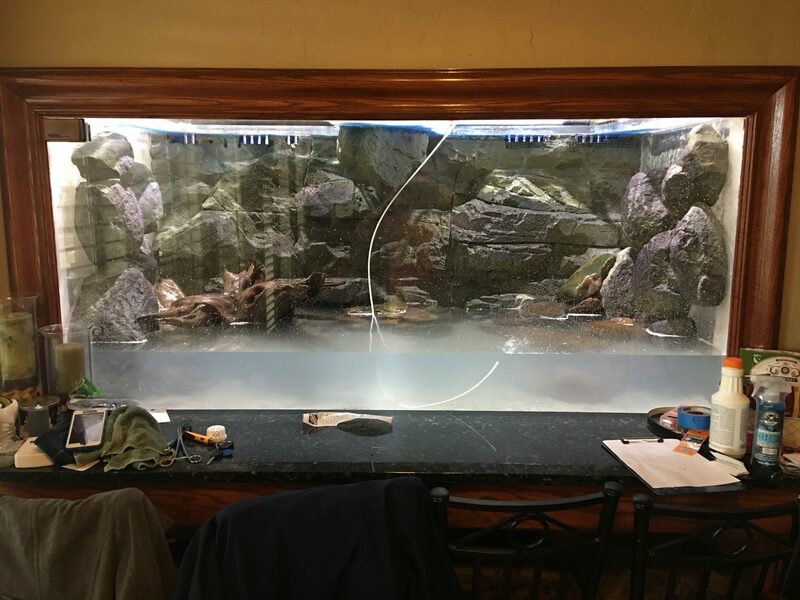 It will be my 20 long I used for my fish QT. 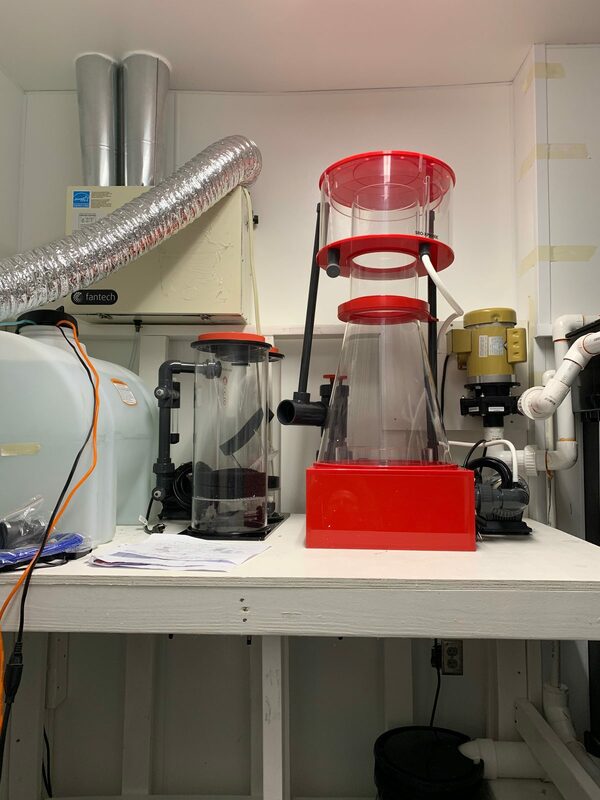 It will include a HOB filter with a biocube or two for biological and a piece of rock from my display. I will keep anything wet in there for 2-3 months and watch for pests, dip corals etc... moving along. I plan to put an AI prime over it so it will match the display tank. Eventually this will be added to the display for a second to reduce shadow. Ill QT a large clean clean up crew , and probably 6-10 frags and see how it goes. Pics as I put all this together. I’m still recovering from my African disaster. Lost half my fish. The rest are stable in the sump. 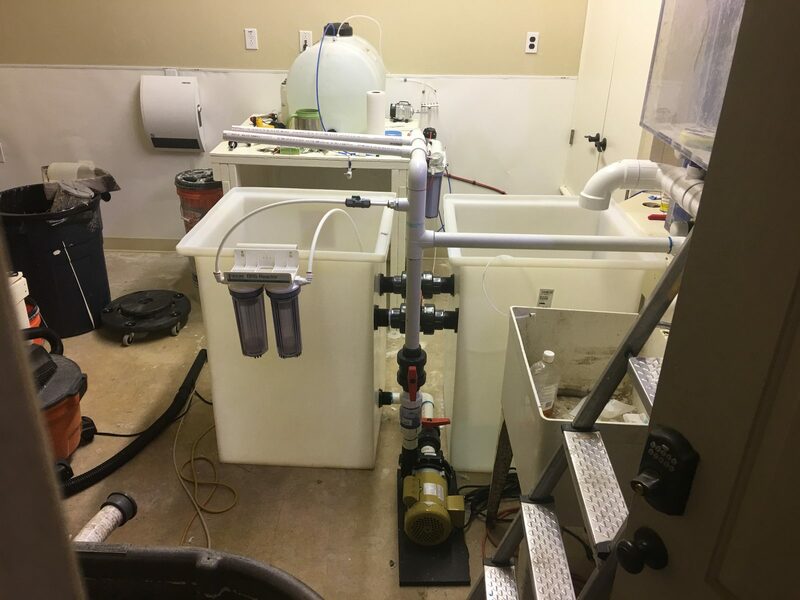 Everything on order or here for the total reboot of the filtration. Build coming along nicely but very slowly. I never use to Quarantine anything back in the day. Tryin to be good about it now days. My two fish are doing great in the display. 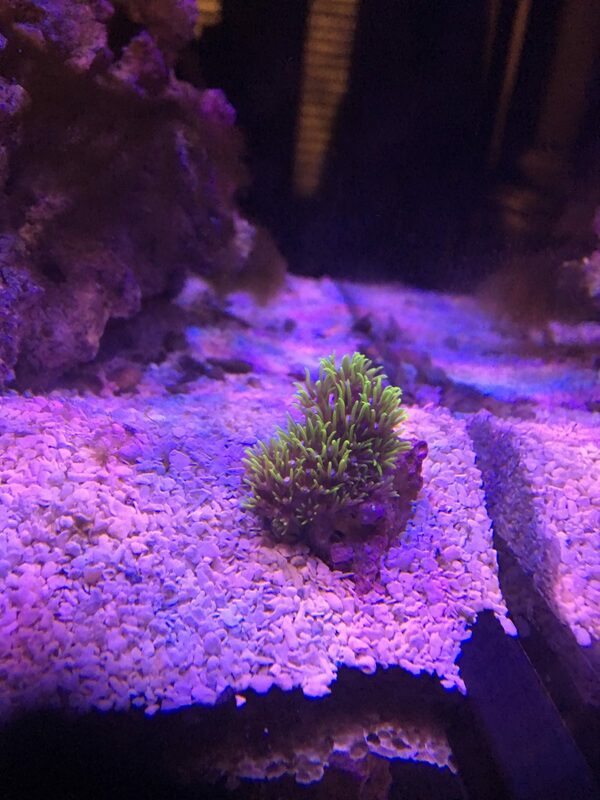 My hair algae that started from my coralline seed rock has not progressed much. My Nitrates and phosphates now read zero. I’m feeding daily unless on call and can’t get to the tank. 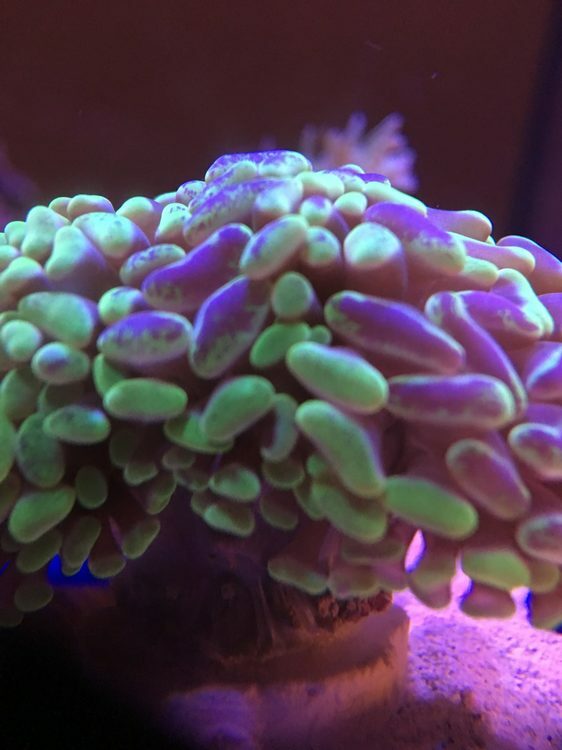 Chaetomorphia is starting to grow in my reactor finally. 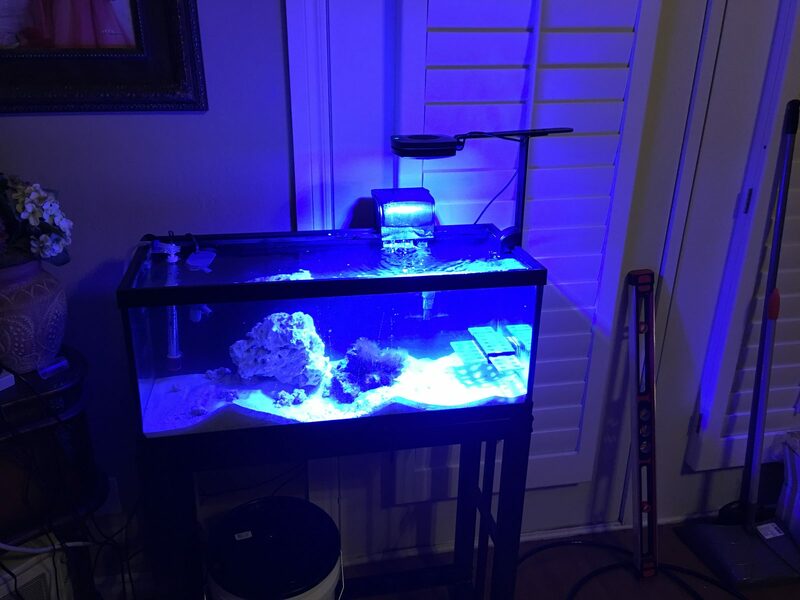 I have my critter tank/ frag tank cycling. 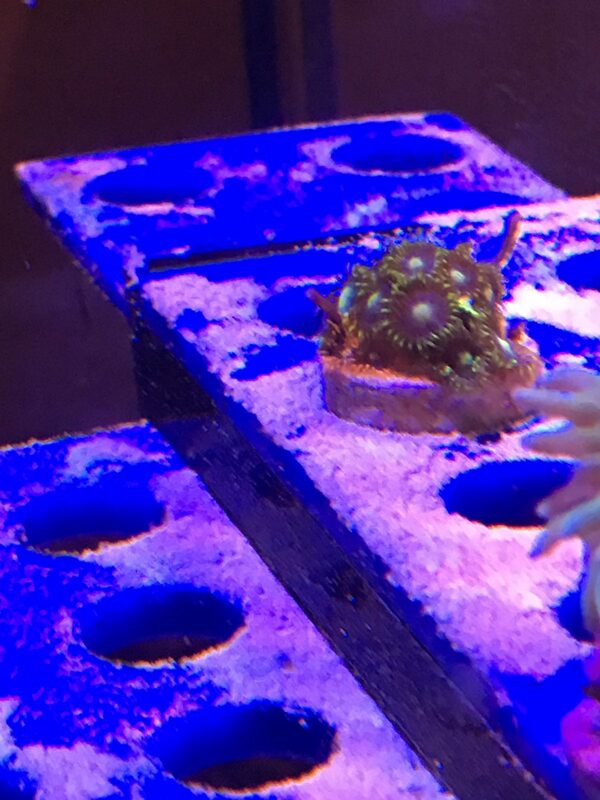 It’s a 20 long with a frag rack on one end, Hob filter, heater, MICRO ATO, and a single AI prime on the coral end. 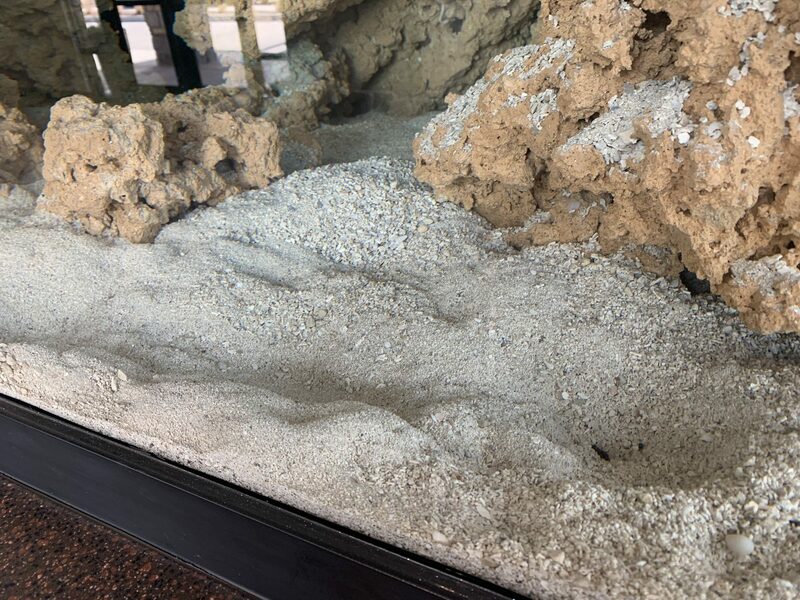 I put a piece of live rock in it from the display and a scoop of sand. Added ammonia and off we go. 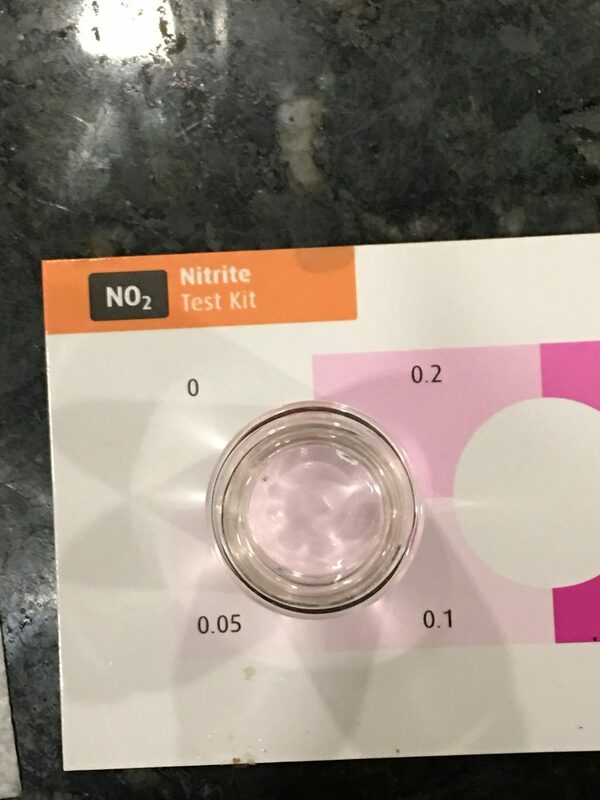 Over night Nitrite was formed and Ammonia dropped to 0.8. Curious how quick this cycle will go. I’m ready to start the long QT process with my first inverts. 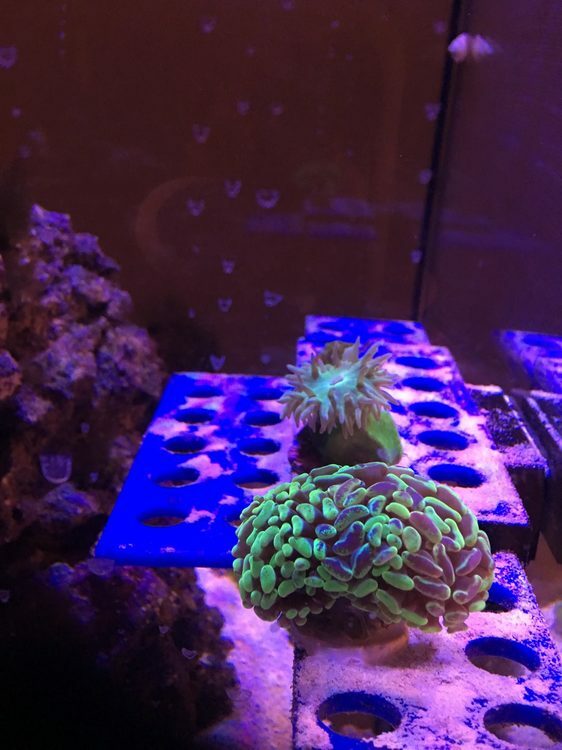 Added to my clean up crew and got some starter corals. So far they seem happy. also got a pistol shrimp. Haven’t seen it since but noticed a bunch of rocks rearranged this morning. 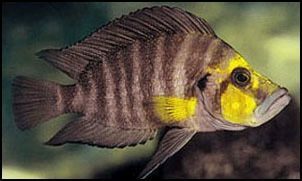 I am hoping it pairs up with my orange spot goby. my second tank has a bunch of hermits. 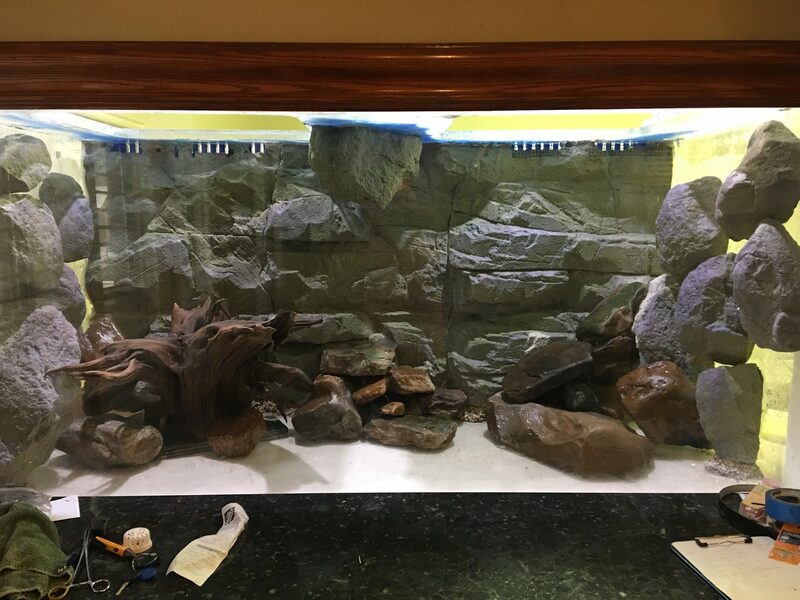 This second tank will be a critter tank and clean up crew reserve for main display. I will probably put some soft corals in here. 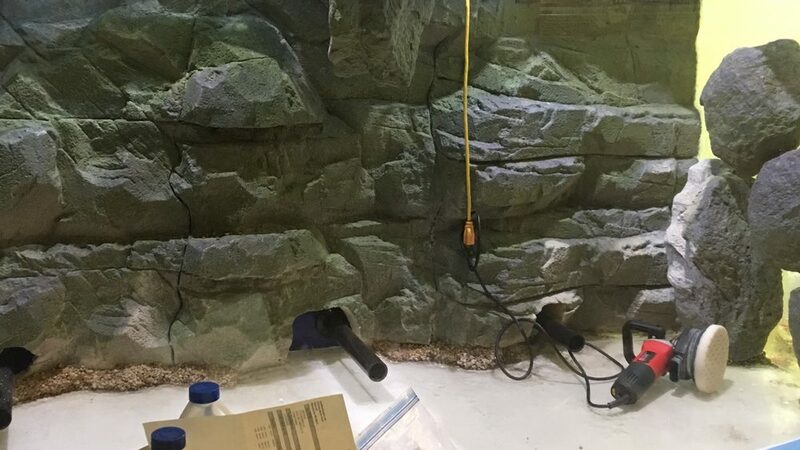 Update, the pistol shrimp is now living in the same cave as the Goby. They appear to have paired up almost instantly. Pretty cool. 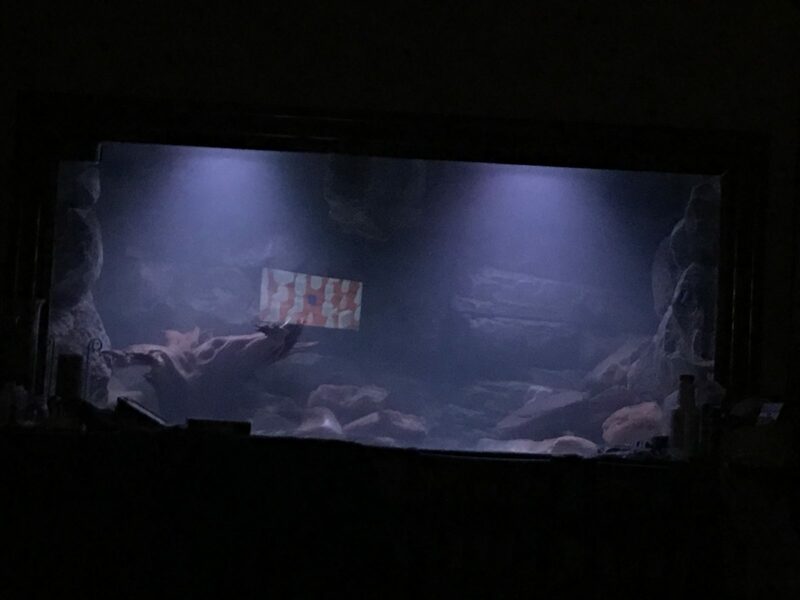 Ok, for anybody actually following this thread, you know I’ve had to basically rebuild my 600 gallon African tank. So I will give a little update on that. 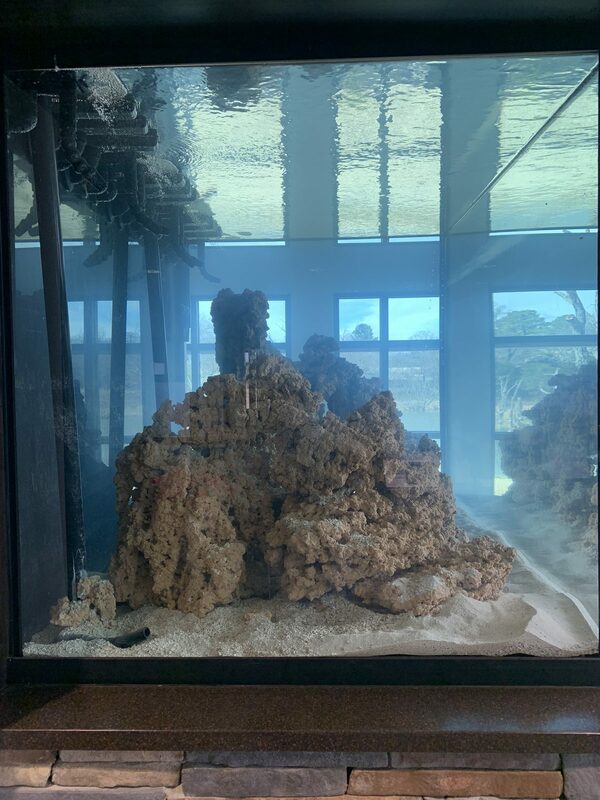 Also we are making great progress on my buddies 800 gallon reef. So first off, my African tank is cleaned out and dry. I’ve polished out the front panel. After 15 years of use it gets pretty scratched up. I’ve ordered a new magnet cleaner that I hope will help prevent these scratches to the same degree in the future. I’ve started re plumbing the tank and took some of the ideas from the office reef. 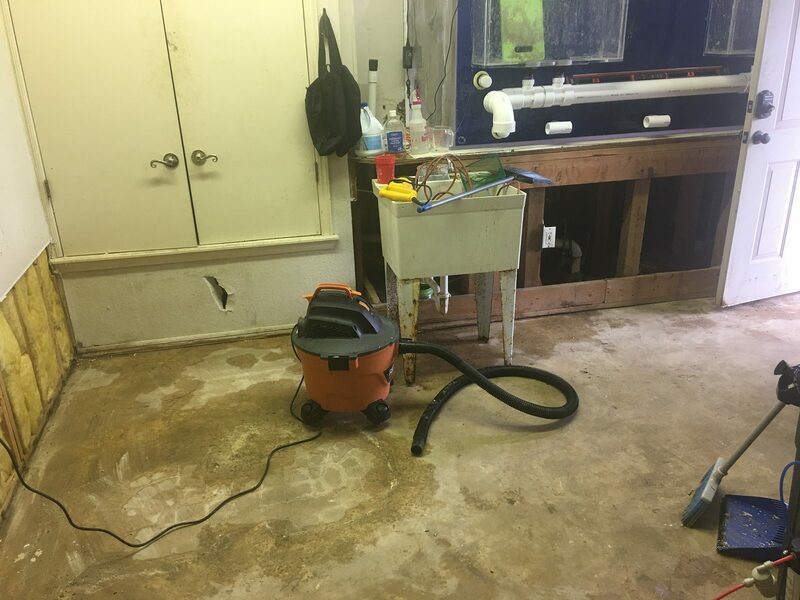 I’m removing all the plumbing that use to go down to the floor. I’m making a main sewer pipe drain that will funnel to a 90 gallon tub that will be a nice moving bed biomedia filter. 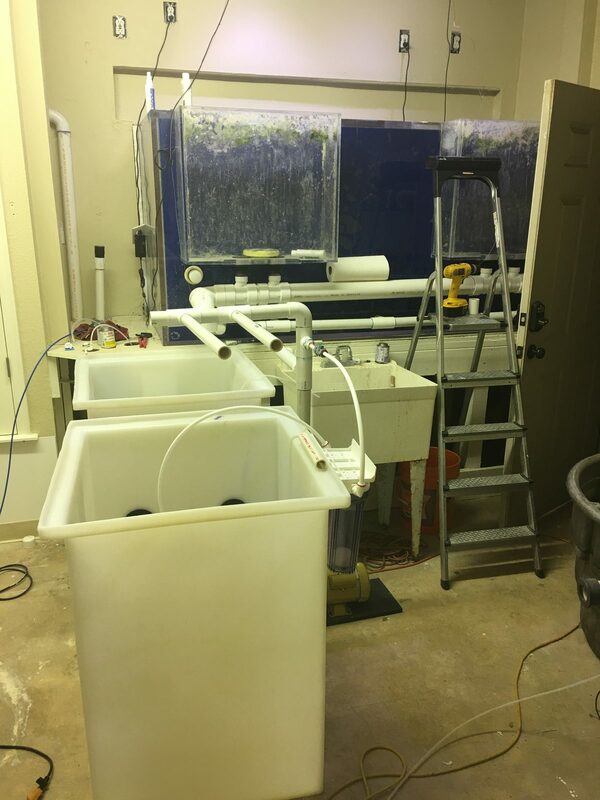 Then a second 90 gallon tub connected to it will be the return tub for added water volume and a place to do final water polishing, carbon filtering, etc.... 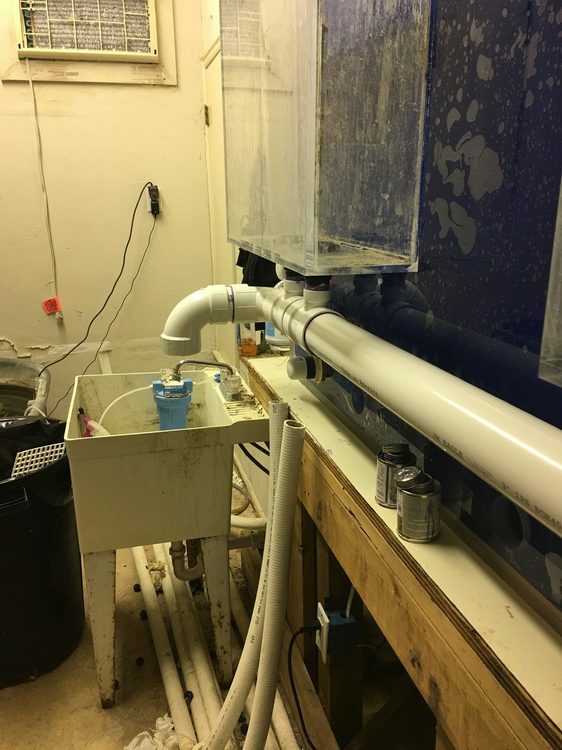 I am still waiting on my 90 gallon tubs to come in so I can complete my plumbing. In the mean time my fish are living in their sump but I’ve set up a temporary pond for them and I’ll move them over when it’s time to tear out my 20 year old sump system. Below is a before shot to show how scuffed the front panel was. In the above picture you can see my random orbital buffer I used to polish out the panel. Came out great. The black pipes are my return bulkheads. These will be hidden in the sand and behind rocks I’ll place once I get the final return bulkhead Plummed. I’ll heat the black pipe up and form some nozzles and point them where I want. Now a brief update to the office reef. It’s up and running. Full of salt water and about to begin its cycle. It has its main sump system in and running. 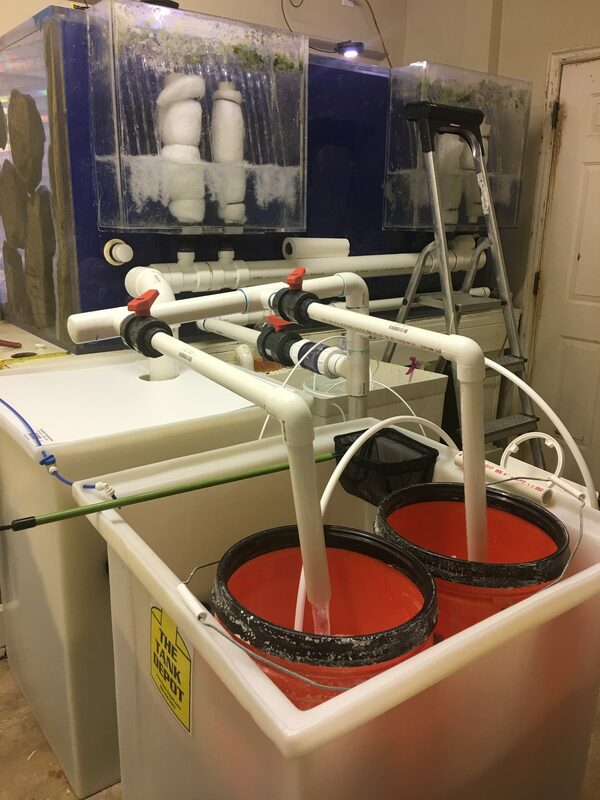 We rigged up a great pre filter bucket setup. 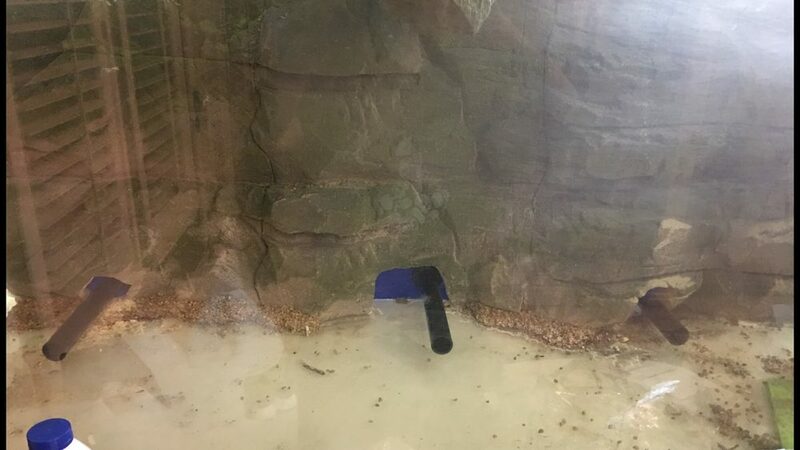 We also set up a closed loop to add circulation from behind and below the rocks. It’s running great. For current there will be multiple powerheads places in the tank later. 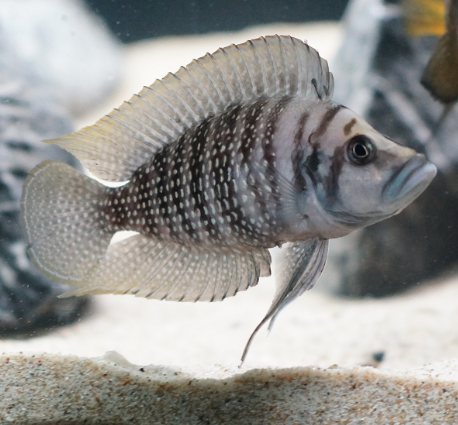 The giant skimmer is ordered and should come in soon as well as a large calcium reactor. 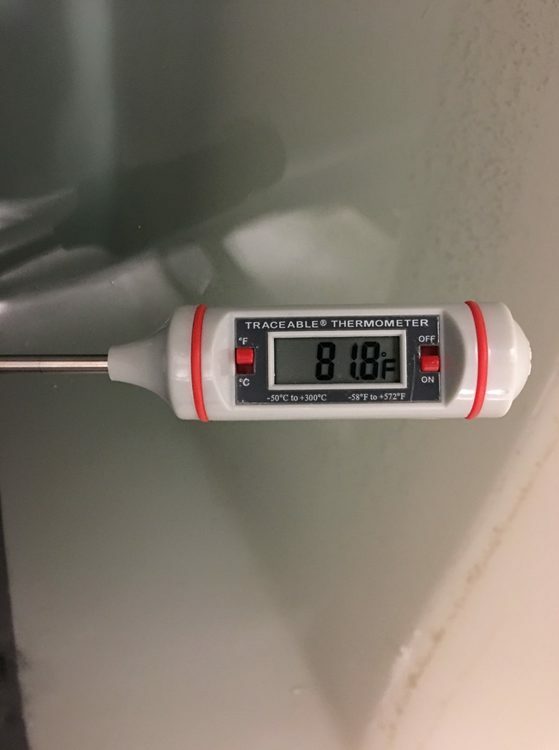 Temp has been calibrated and set to 78. Here yiu you can see the Hammerhead pump for the closed loop. It’s pumping around 7,000 gph through 7 pipes behind the rock structure pushing water towards the front of the tank. We built a wooden stand stand for our water storage above the sumps. The external skimmer will sit to the right of the water storage as will the calcium reactor. We have lots of height in this room so we may even have to go up more for space. The wires and hoses will be better organized....right Tre! Ha ha. You can see the black bucket in the first sump. 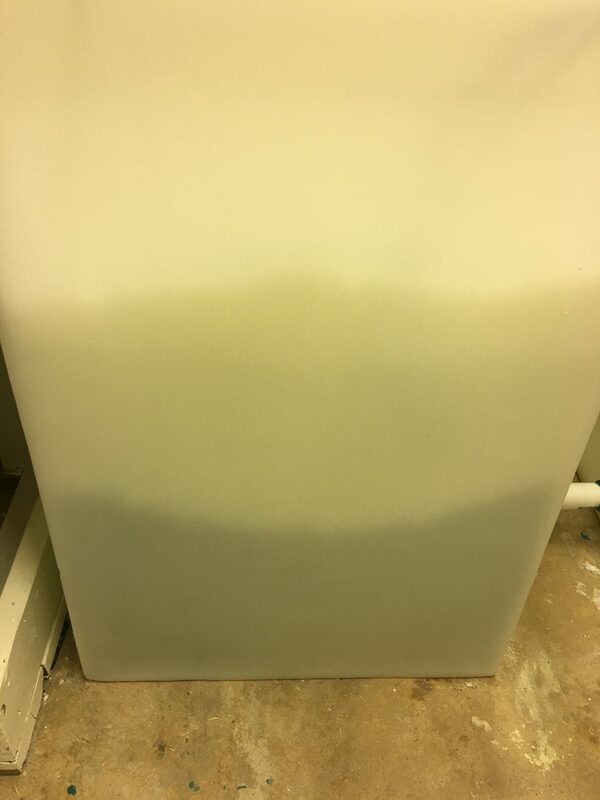 All overflow water flows through that and it’s full of mechanical filter media that’s easily changed. The water then flows to the second sump and this will eventually be a refugium for growing a big ball of Chaetomorphia. 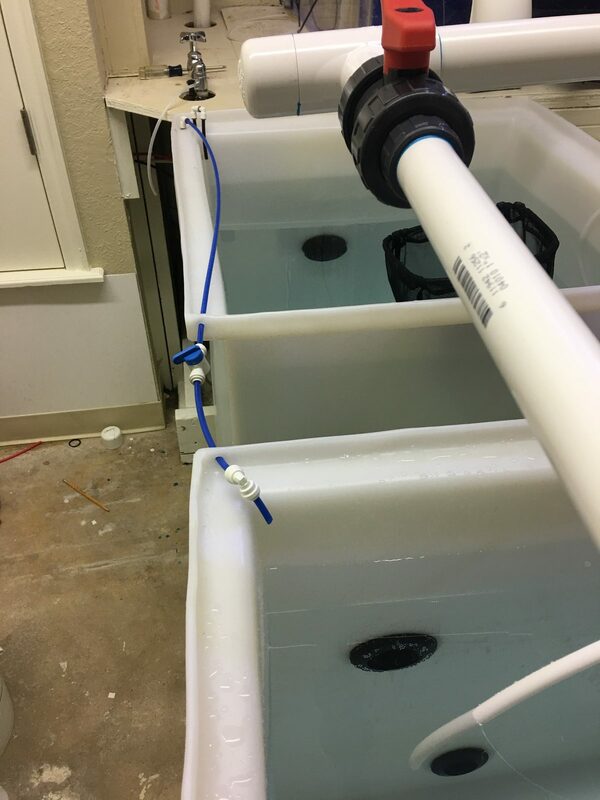 If we need to do a water change we can remove it and separate the second tub off from main circulation and mix 90 gallons of fresh salt water in there and just open it back up for an instant water change. Super easy. 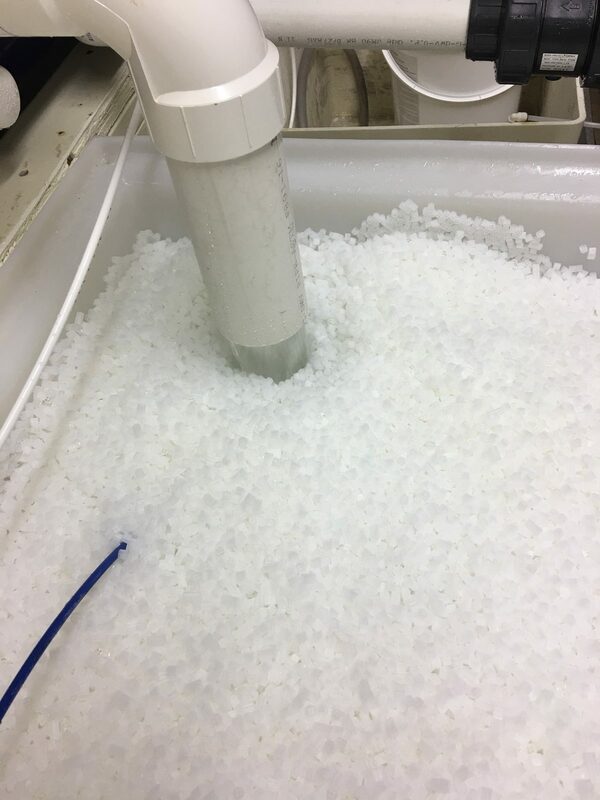 Then water flows to the third tub where it will settle and get returned to the tank. 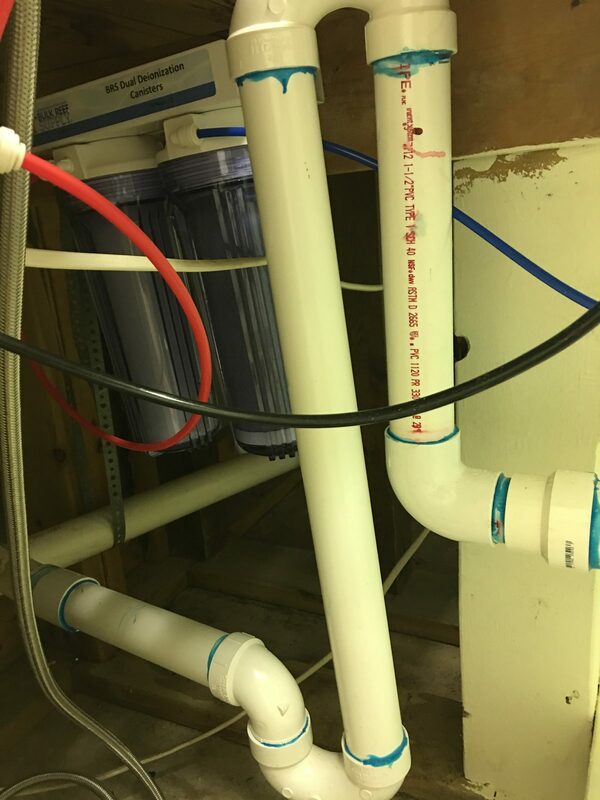 This is where the float sensors are for auto top off from the above RO tub. It will be controlled from a solenoid that gravity drains from the RO tub through the DI resin below and into the sump. 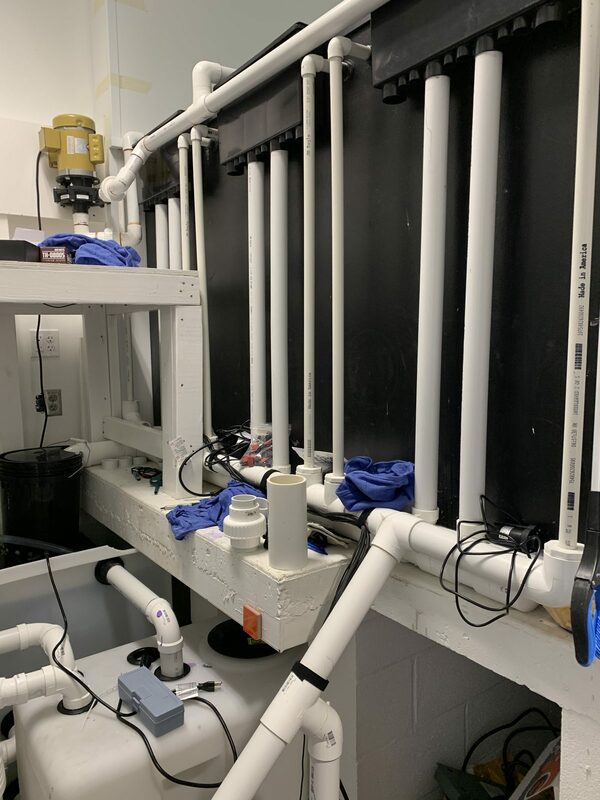 We separated the DI and RO so we could aerate it to get rid of Co2. We have high Co2 that kills DI resin here locally. Above the RO tub on the back wall you see an air exchanger. 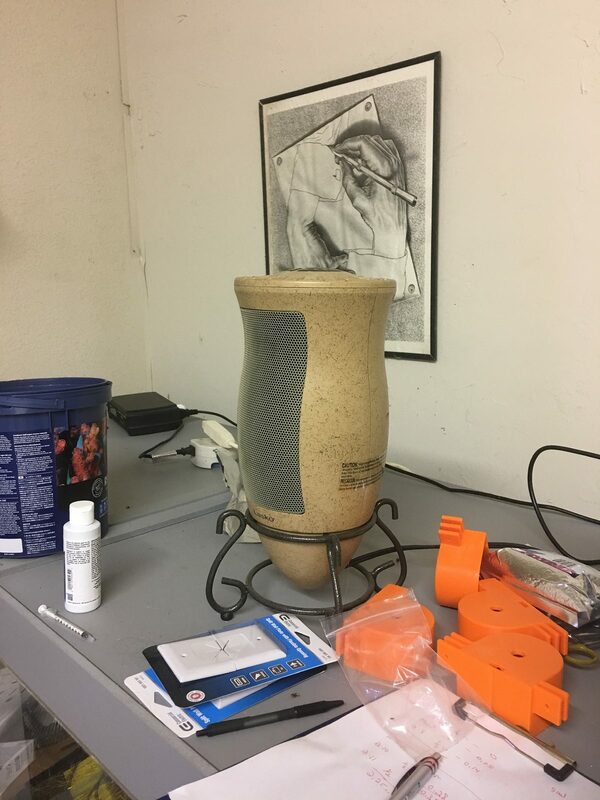 It pulls air from outside and exchanges it with humid air from the room. It has a heat exchanger inside that temporizes the incoming air to preserve and stabilize room air temp. Here you you can see the RO unit above that fills the tank. 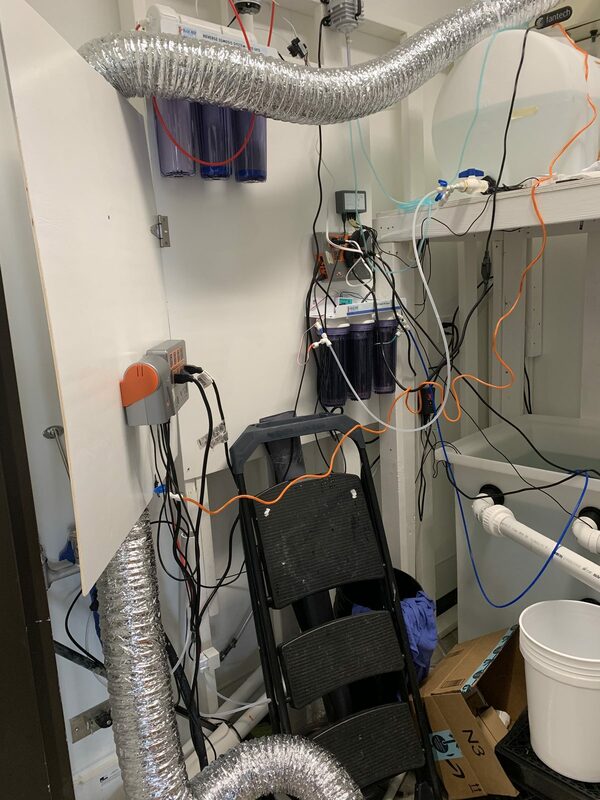 There is an air pump to the right of it that does the job of bubbling out our Co2. I love the canopy on the office tank - very slick. Also that is some intense plumbing all around! For sure. Has been kinda crazy. We had to cram a lot of stuff in a small space. 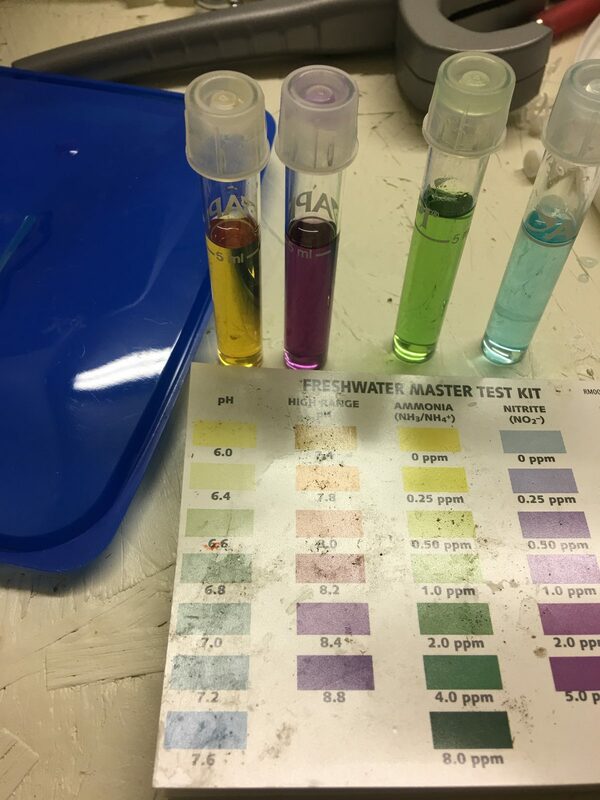 Jeff, your water test kit grabbed my attention. being color blind, color based tests are a PITA for me...but your pictures intrigue me. please tell me more? I use a mix of Red Sea test kits and Hanna checkers. Since your color blind I’d suggest as many Hanna checkers as you can afford. Or get someone to help with colors. Pictures work great and post for opinions. I find it easier sometimes to take a picture then compare as the glair from the water and glas sometimes makes it hard. so the Red Sea kit comes with the lil shot glass and card to place it on, then? and yes...Hanna's would be smart, LoL! Yes. I like the Red Sea kits so far. Seem very consistent and pretty easy to read. 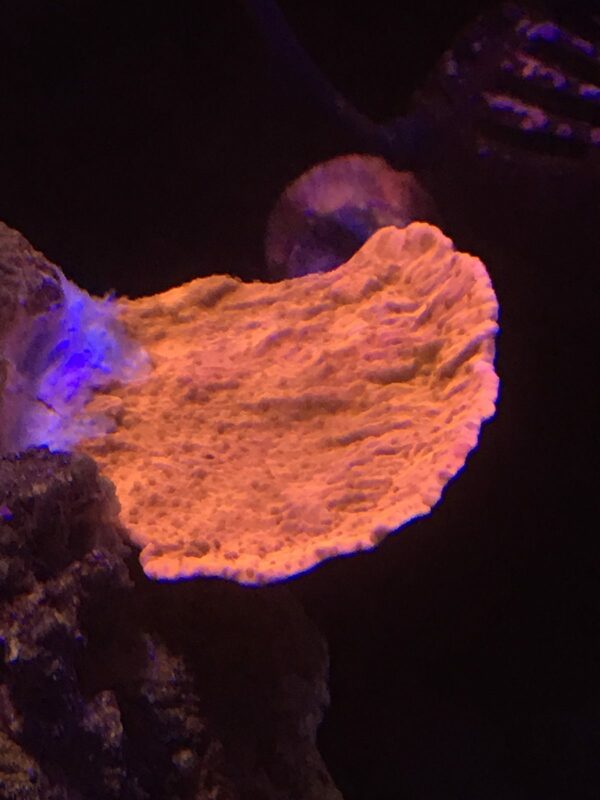 Im about to glue my new frags down. I’ve got a Hammer, Duncan, some Zoas and some GSP. I’m going to keep the GSPs on a rock in the sand. They will be kept off the rock structure. The hammer will go lower left and not sure yet about the Duncan. All the corals have looked fantastic, seem to like my water and lighting. The Hammer looks bigger but I’m sure just more extended than at the LFS. All my nuisance algae is gone at the moment. My Chaeto is starting to grow but nothing spectacular. I’m feeding almost daily. 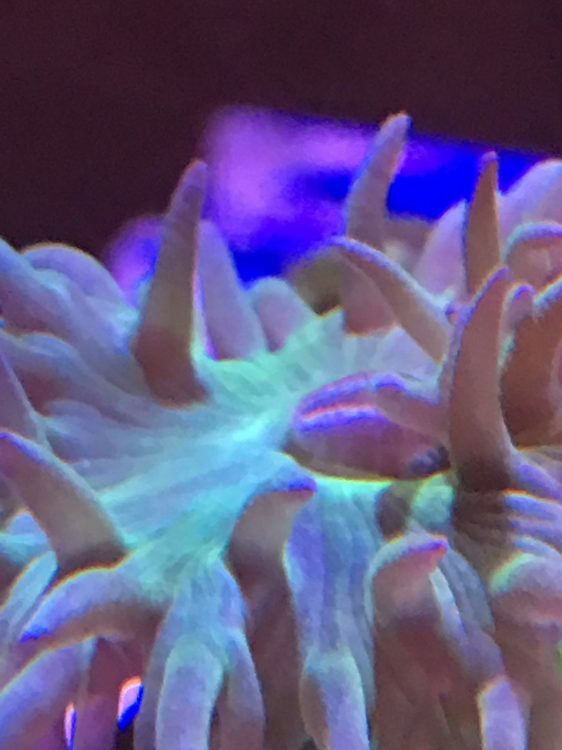 I’m also spot feeding some reef roids to the corals along with the Duncan capturing some meaty foods all in its own during feeding. I’ll post a few pics once I get them mounted this week. African tank rebuild. This has been a big project and has taken me away from my NANO. 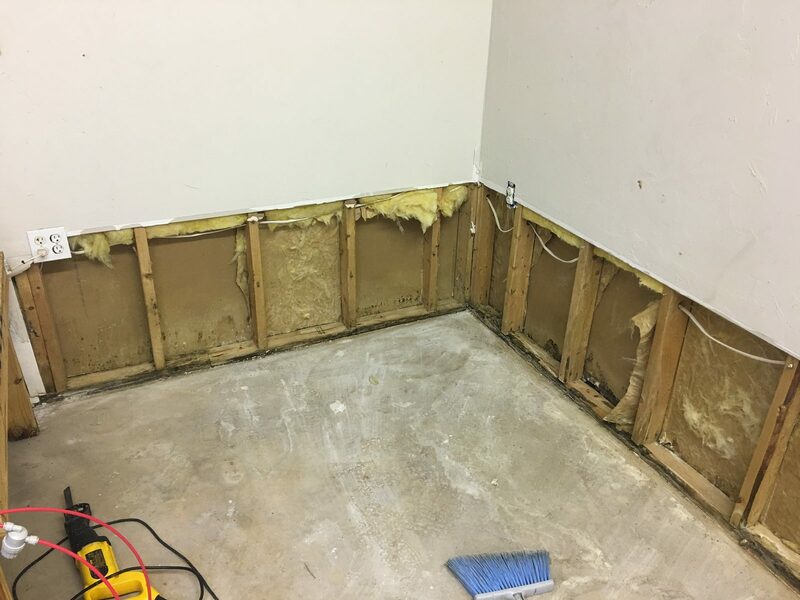 I finally got all the old sumps, lower drywall, old electrical torn out and am in the process of replacing it all. I should have the inside drywall hung today and then covered in FRP. 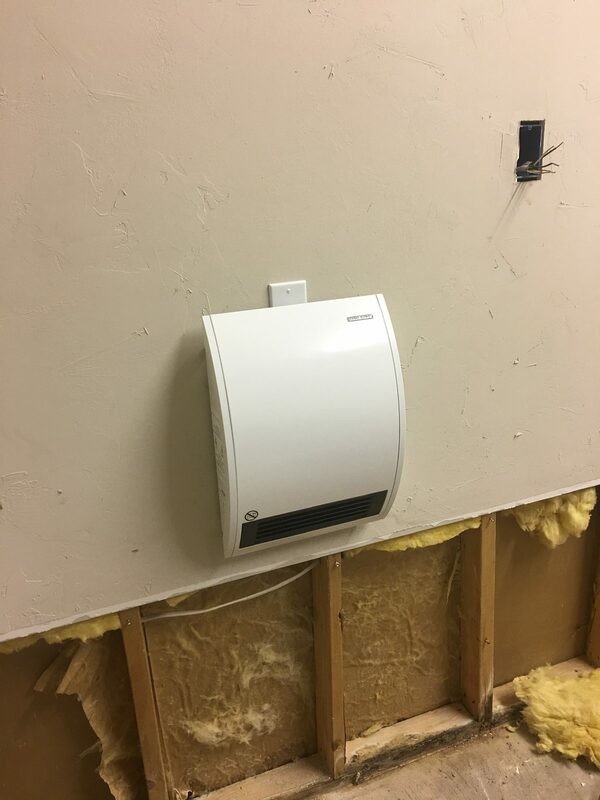 I’ve installed a hard wired heater for the winter to replace my bathroom heater I’ve been using for the last several years to keep the room warm. 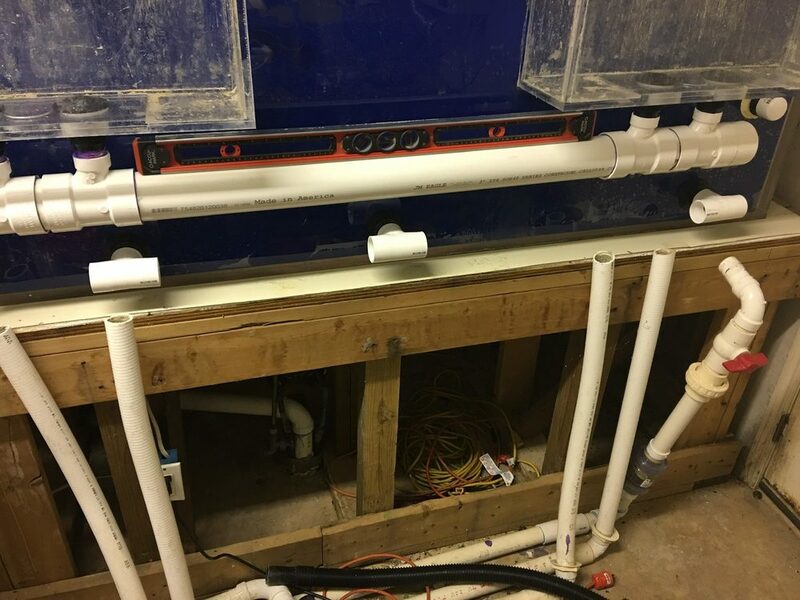 I’ve also got my new sumps in and will begin th final plumbing layout once I get the walls completed. 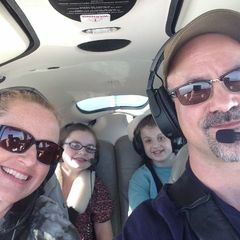 Here are are some progress pics. 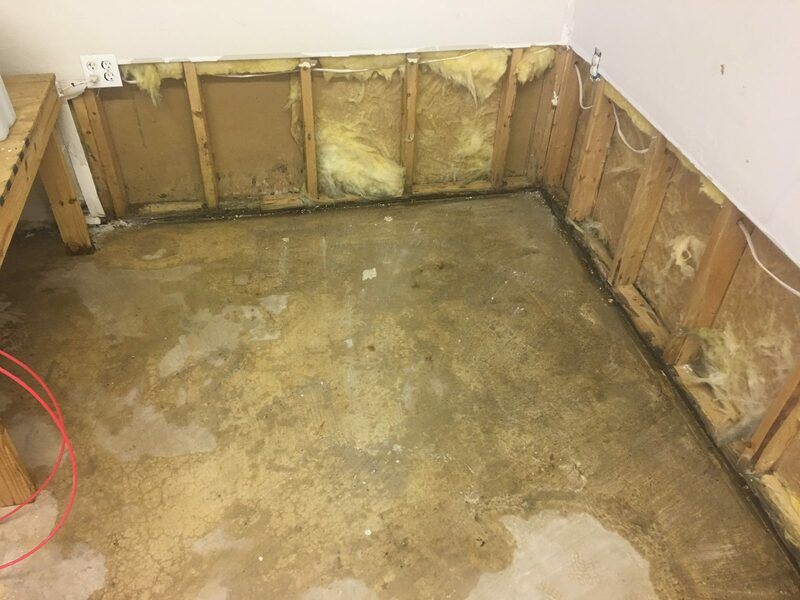 Below is just after tear out and sump removal. 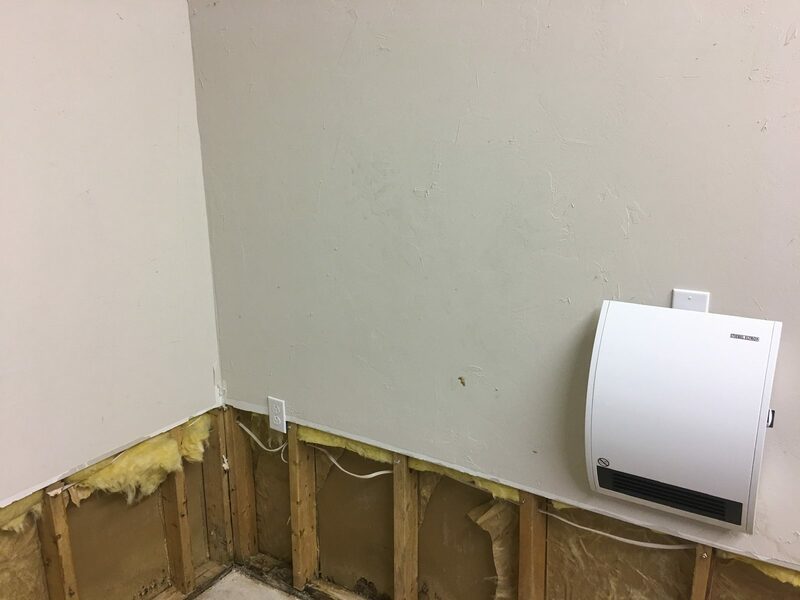 Sink is in the old location and will be moved. Just a little modivation juice. Here is is one of my new sump tubs. There will be two. This one will be the bio tower and the other will be for water polishing and return to main tank. They are both 90 gallons each. 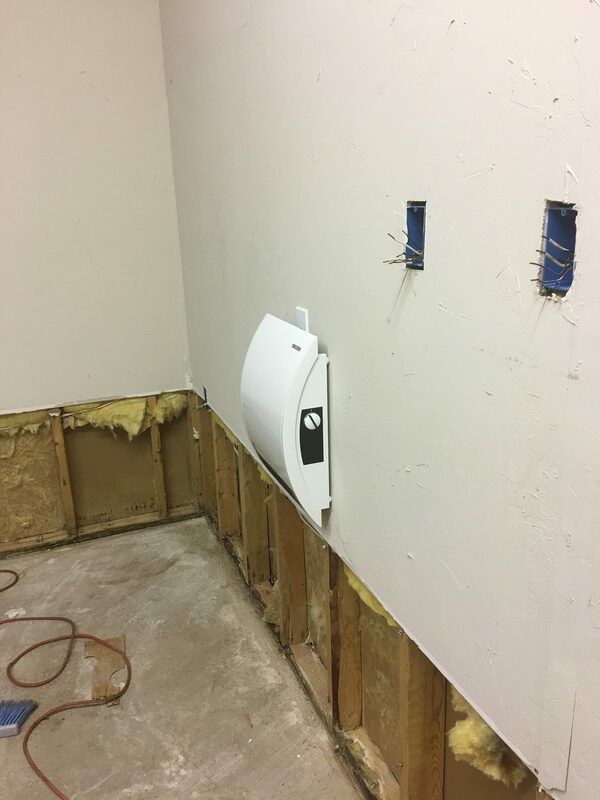 The sink is sitting in its final location. I moved all the plumbing over and re did the drains with all new hard pipe. Ive sprayed all the old mold with bleach and it dried out. 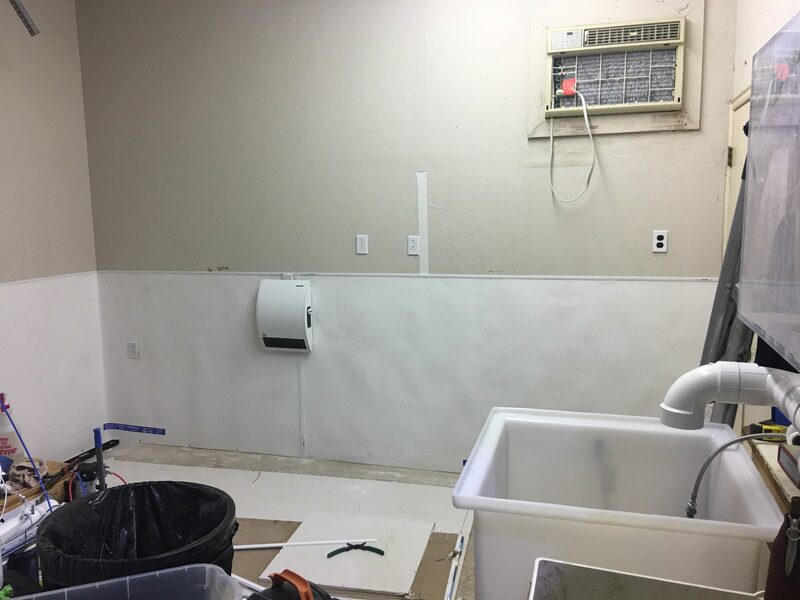 The Sheetrock on the other side will also be replaced from the other side. I’ll finish the insulation at that time. 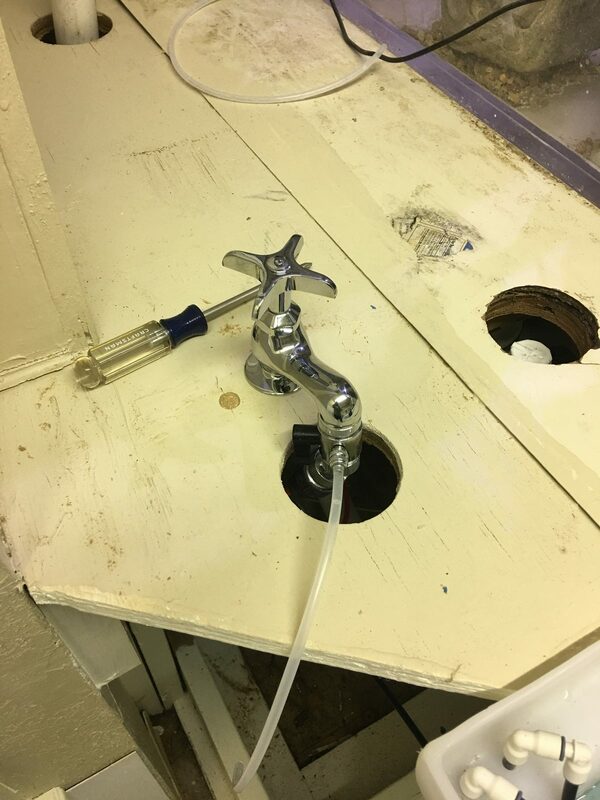 New sink plumbing. I’ll slap some paint on these old rusty legs. 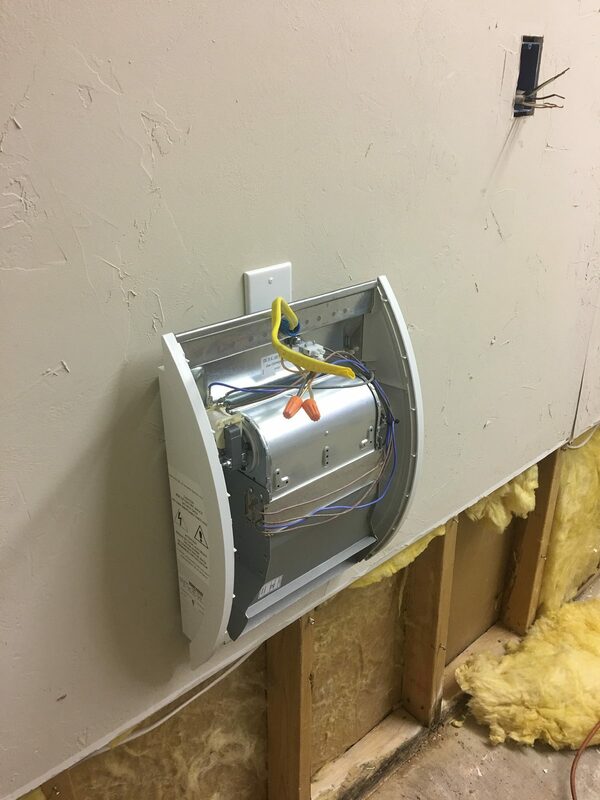 Here is my new heater install. I’m loving it so far. 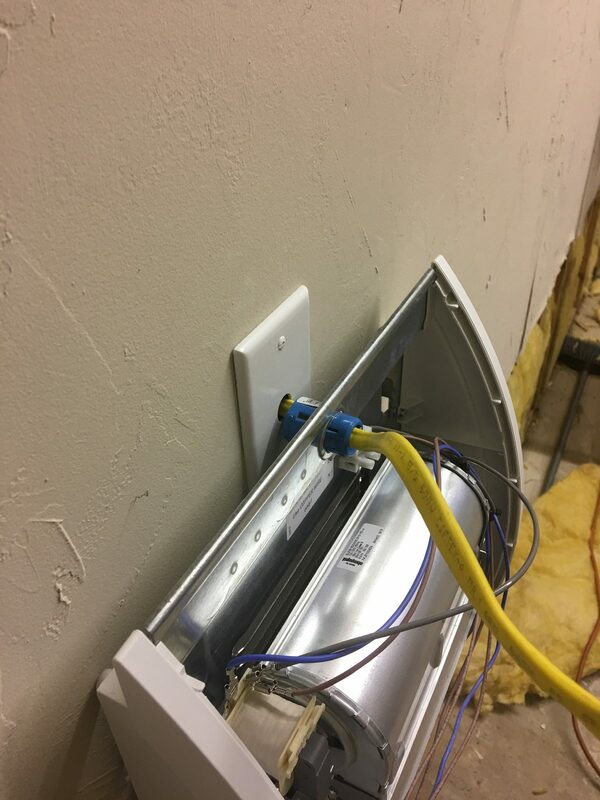 You can also see I’m replacing all my old electrical plugs. They were getting corroded from 20 years of aquarium room use. Here is the old 1000 watt heater I’m replacing. It’s sitting in top of the old snake cage that I’m replacing with a new and better ventilated one. Pics later once I get it installed. 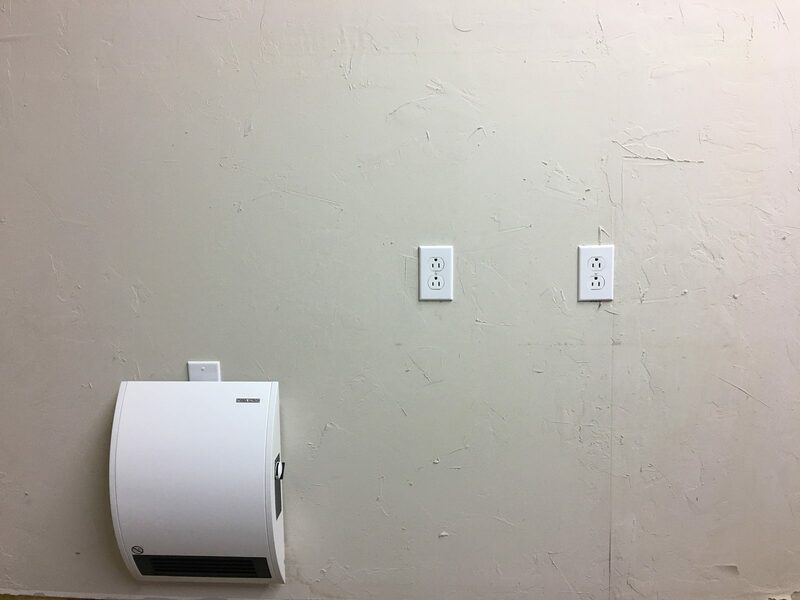 Heater and two of the new outlets installed. Pic after sump tear out. There was some water trapped in my old plumbing. One LAST flood I hope. This is before I sprayed bleach and got everything cleaned up. 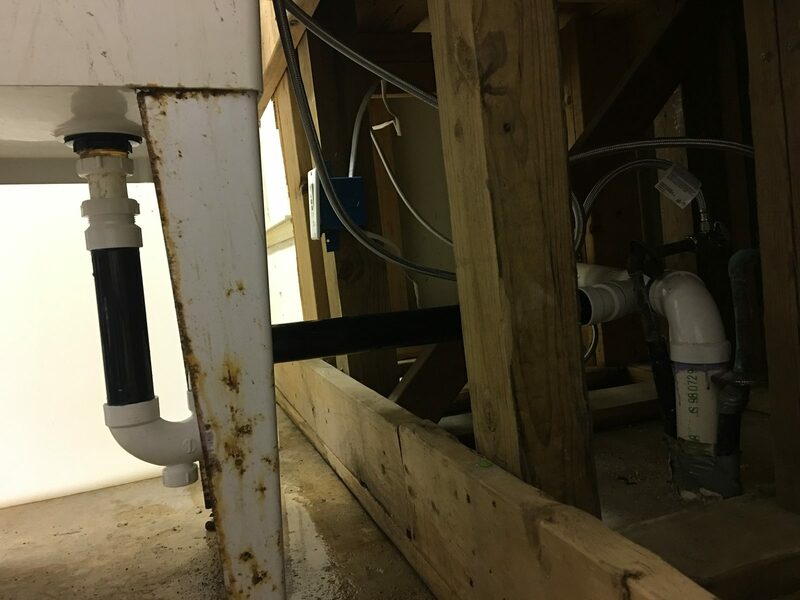 When looking back at my old plumbing I have to think “what the hell was I thinking” back then. 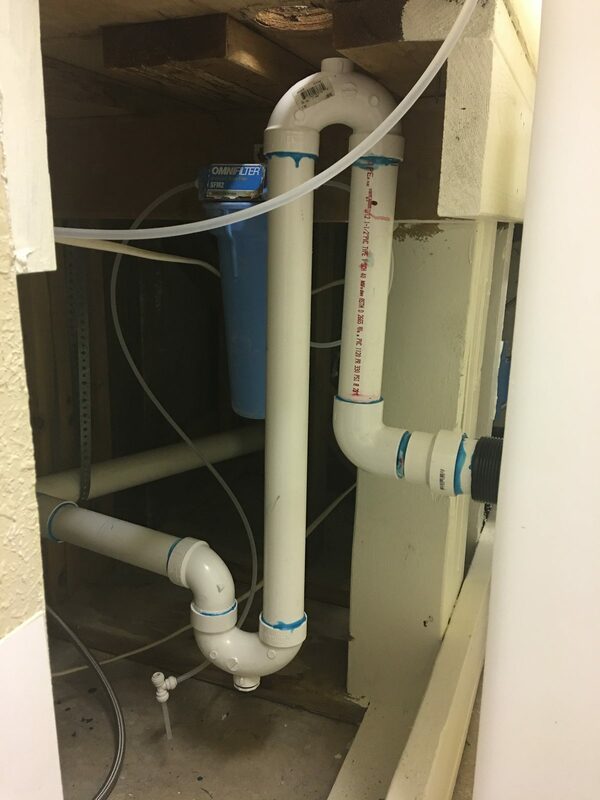 My plumbing skills have come a long way. Really glad I’m rebuilding this room. Update on the Office reef. 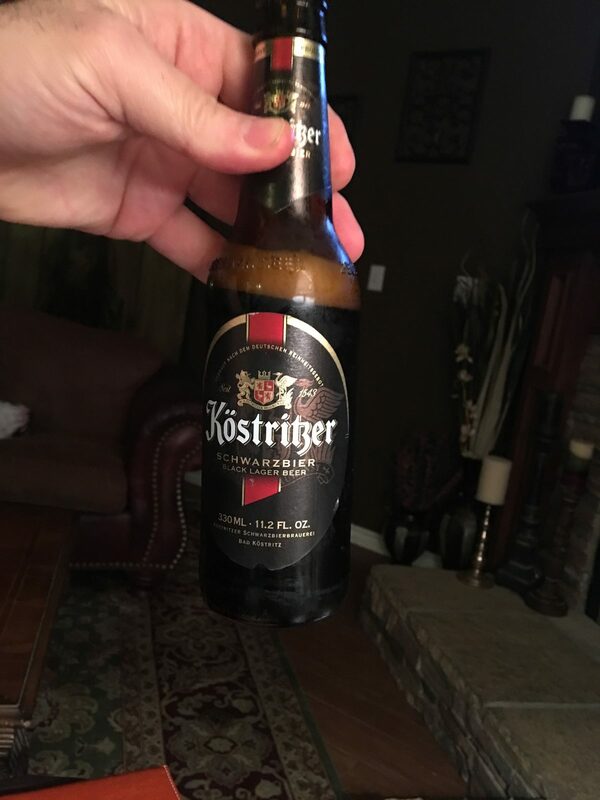 Not much new here. We have got it running, temp stable, salt in and it’s cycling. The new protein skimmer and calcium reactor is here but yet to be plummed. Im letting my buddy do all his own organizing from this point. He’s not as OCD as me so it’s kind of a mess at the moment. I’ll be curious if he ever gets it organized. He’s the type that fine with it as long as it works and it’s out of sight. 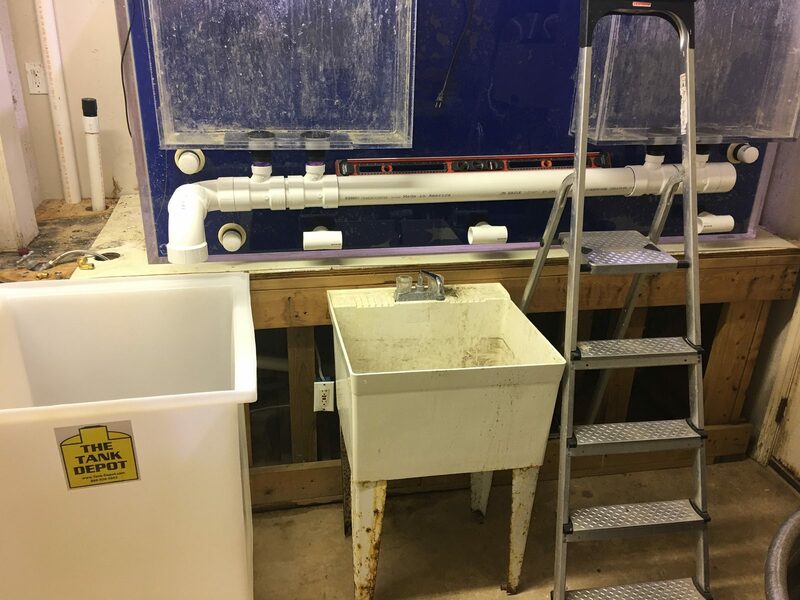 Here is his skimmer and reactor waiting to be plummed into the system. No rush on this as it’s not needed yet. Making progress. FRP hung. One more wall to go. Next up, remove the old corroded AC unit. 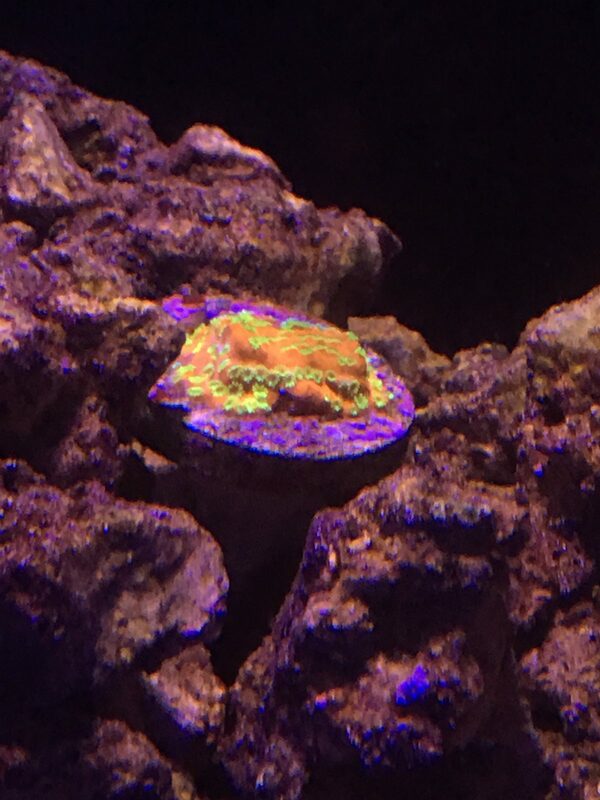 After just a couple weeks occasionally dosing Reef Roids I noticed my pod population exploded. These were seeded early on but I thought they all but died off. Guess they could have come in on my corals but I dipped them and figured the dip would have killed them. My dip killed amphipods for sure as I saw a couple just fall off a plug and pretty much die instantly so pod re seeding is unlikely. More likely is the originally seeded pods like what I’m feeding at the moment and now reproducing nicely. Either way I’ll take it. 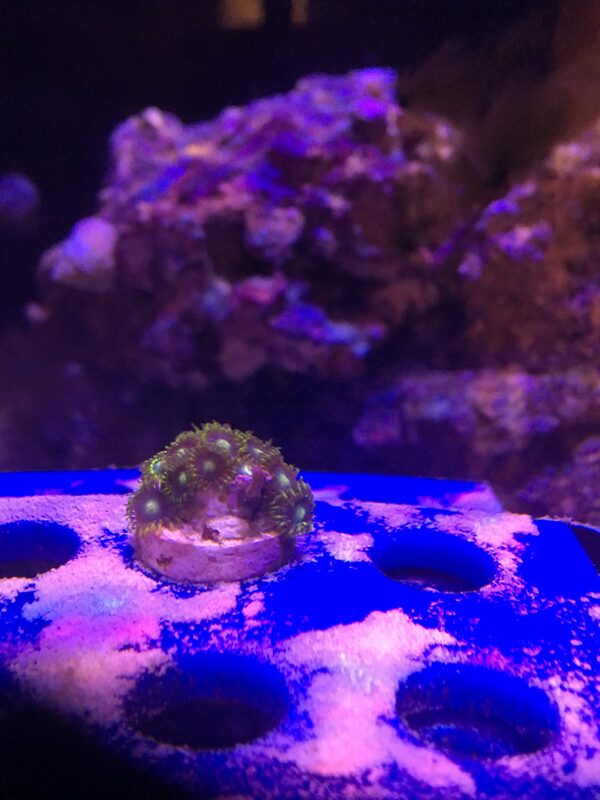 Corraline algae has began to grow and is spreading nicely. all corals doing great except one montepora that’s not happy. It got moved to my QT tank. I hope to be glueing these all down soon. Just got to decide on where in the tank I’ll want them. Since feeding reef Roids I’ve noticed an explosion in my pod population. But no obvious growth in corals as of yet. My pistol shrimp seems bigger and has rearranged the tank to its liking. Love that little guy. 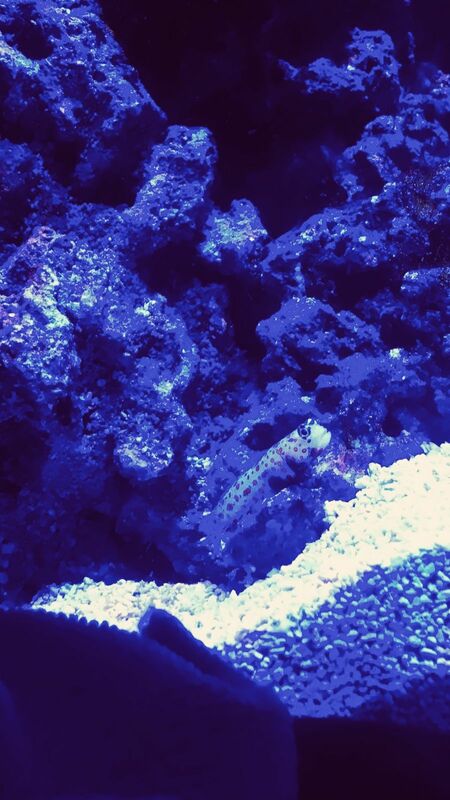 The Goby is doing its job keeping an eye on it. My african tank is very close to being wet once again. The room is turning out much better than I could even hope for. Much more compact and efficient plumbing than before. 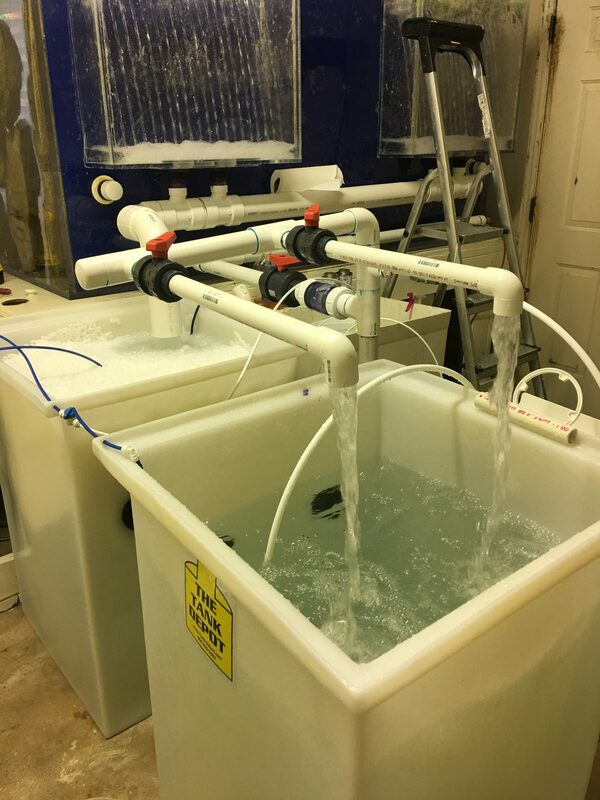 I’ve tested sump one and no leaks and my auto water change drain overflow is working great. The set water level is good but won’t know if I need to lower it until it’s all running. Office reef is almost cycled and Fish QT should begin soon. 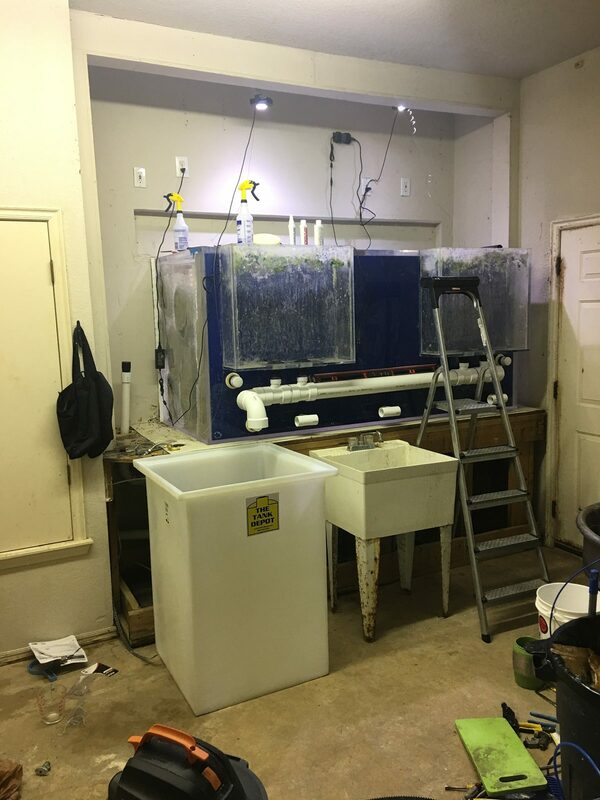 Here are are a few pics of my African sump setup and room layout. 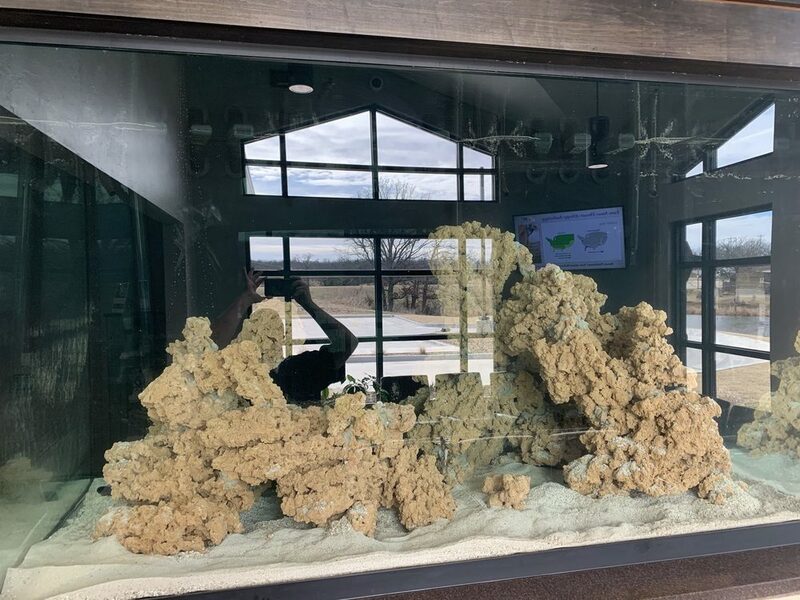 Just a few more valves and check valves to put in and then Aquascaping will begin inside the main display. 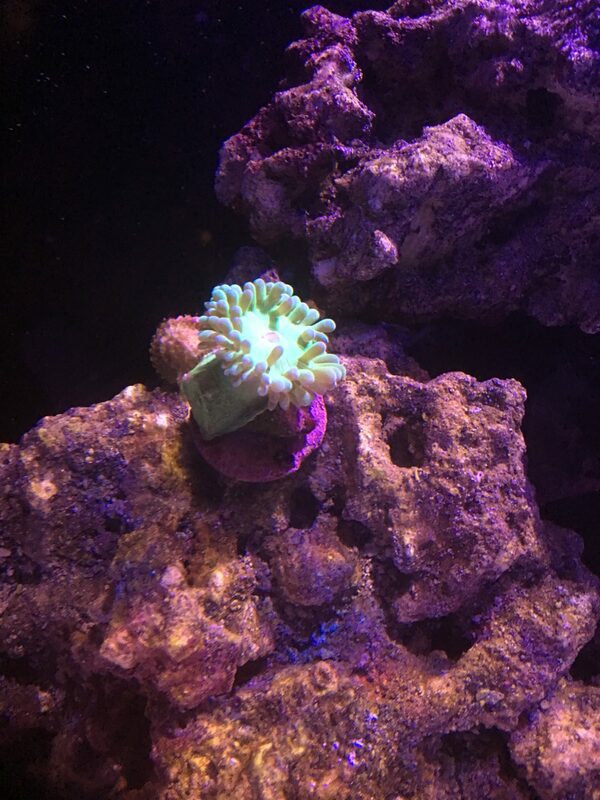 Finally glued a few corals to my rock. Algae reactor is pretty green so it’s doing something and Corraline is really spreading. Tank is very stable. Only issue I need to solve is finding a source of stray voltage. I notice a slight sting when I reach into the tank. 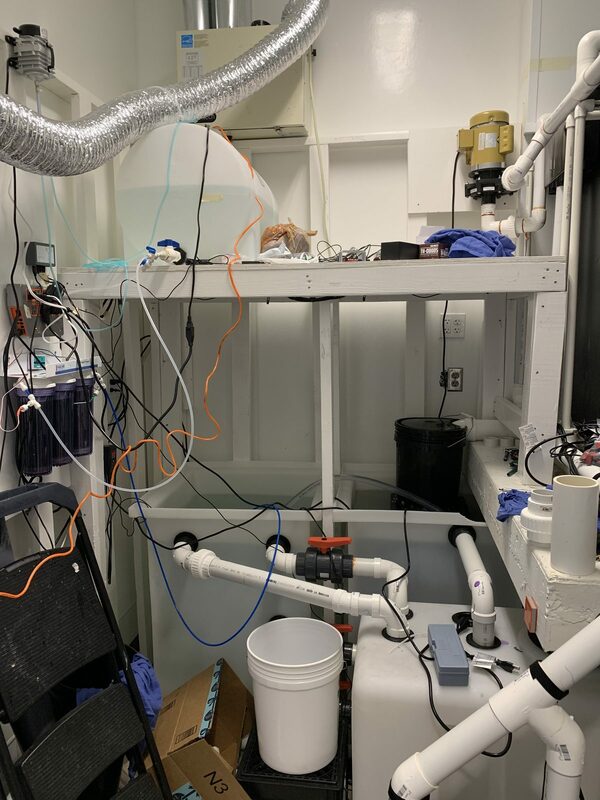 Little more plumbing on the Fish room today. 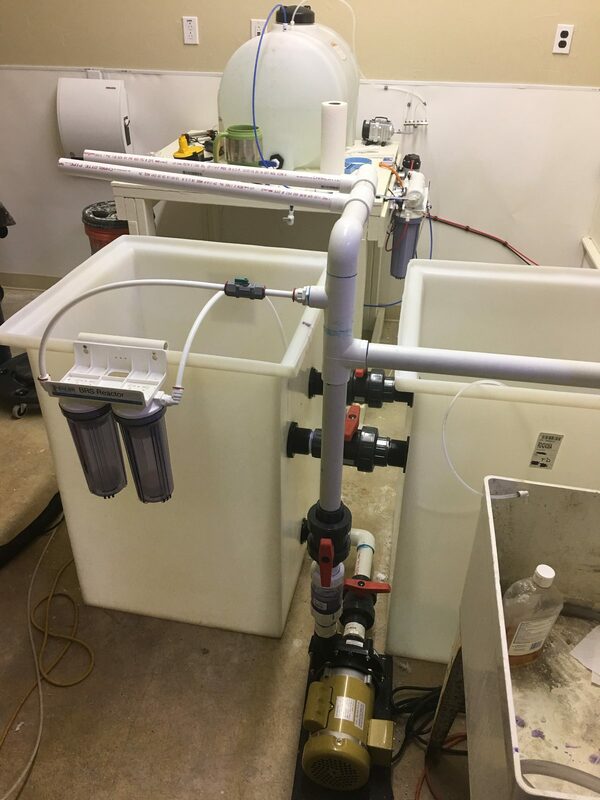 Re did all the feed tubes for my RO salt mixing station and auto water change setup for the African tank. The return manifold for the African tank got a new valve and a check valve. It’s now done and ready. 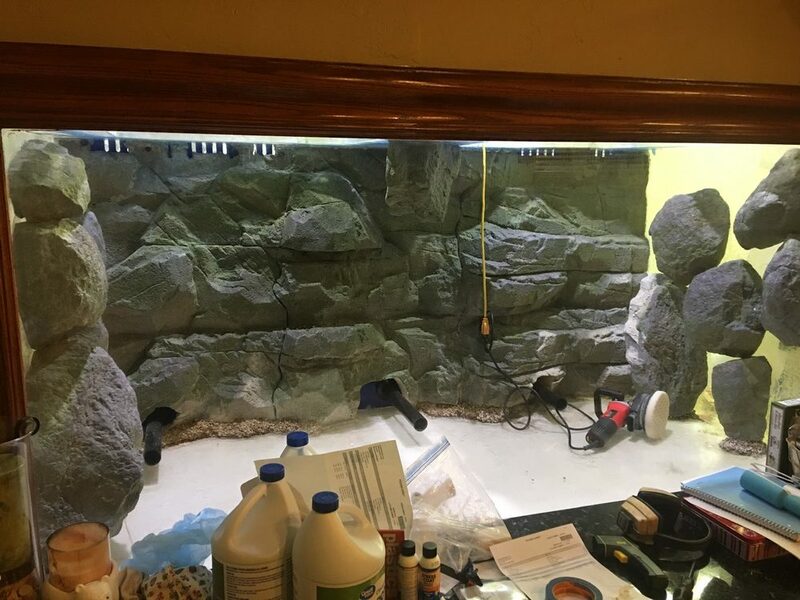 Next up is to finish the electrical refurb above the tank and start aquascaping. This shouldn’t take me too long. Then I’ll fill it and hopefully get a quick cycle. 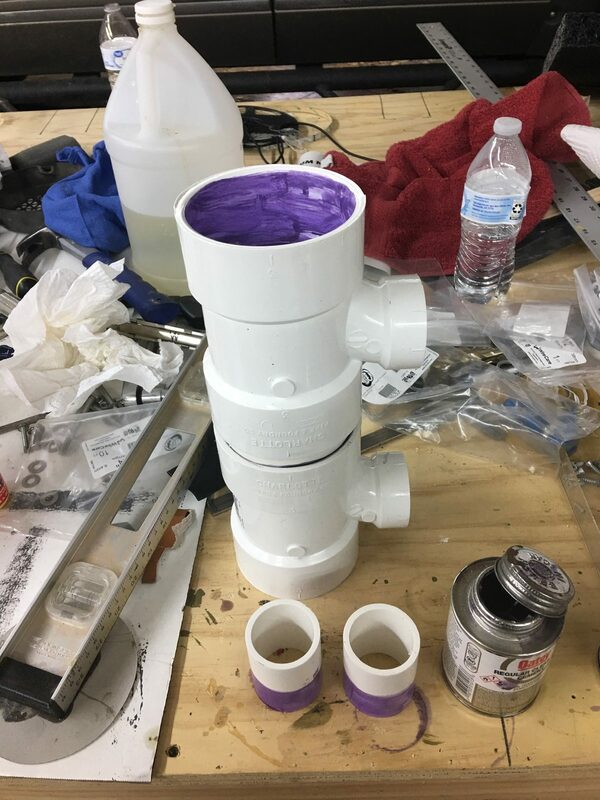 4” pipe feeds the sump from the 4 overflow pipes. 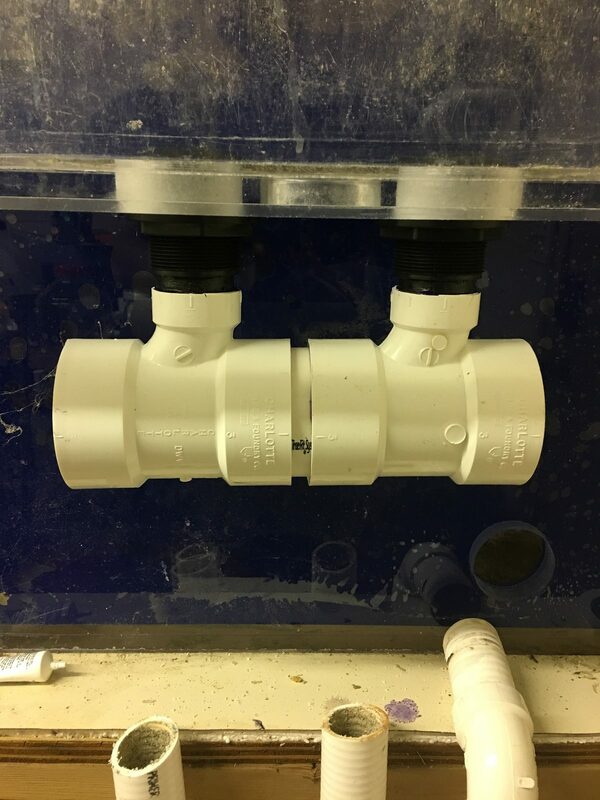 The check valve and ball valve is on the outflow side. 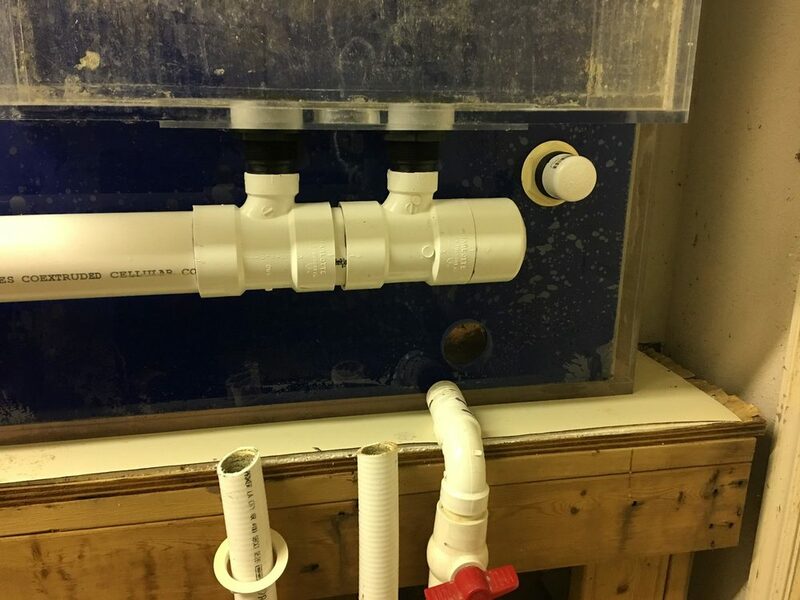 Below you can see one one of my manifold valves that will feed two DIY canisters Inuse as a water polisher. 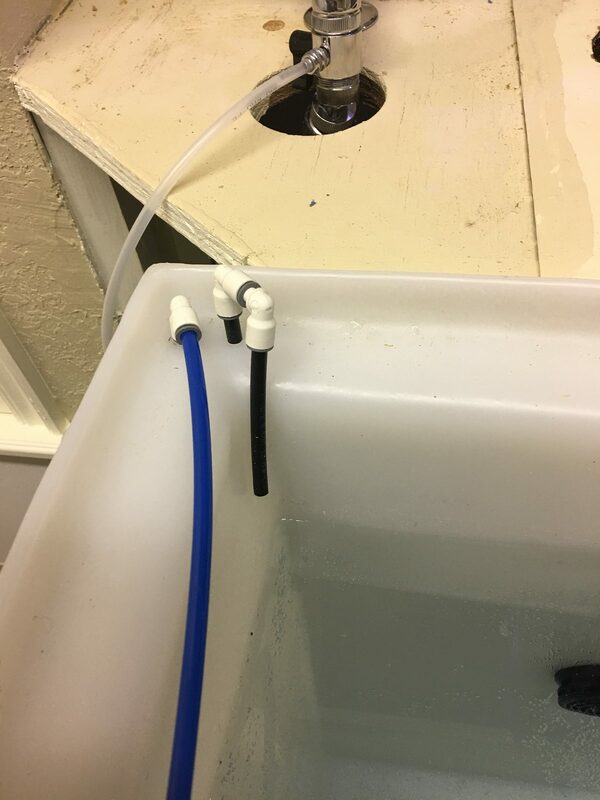 The blue RO tubing is my auto water change feed line. It will continuously drip into sump 2. 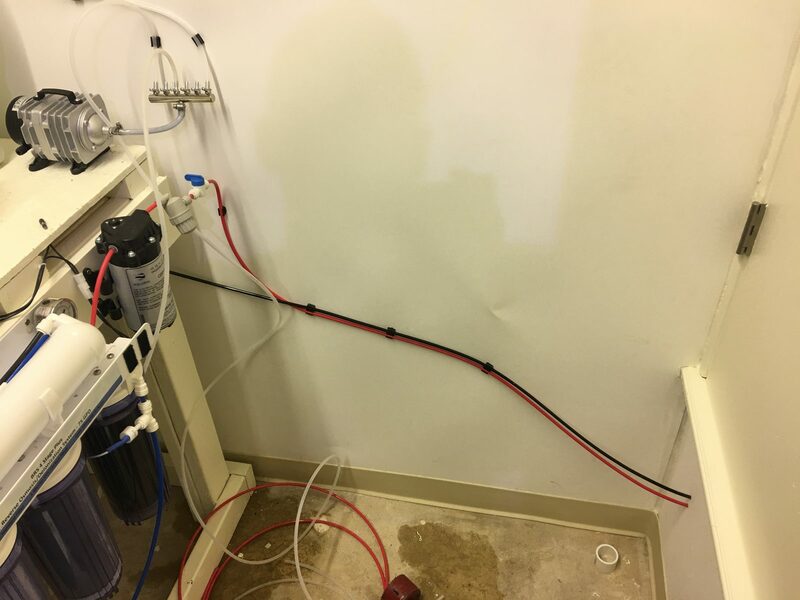 The black line below below is the waist discharge line from my RO unit. It will dump into sump 1 when making RO water basically added water change water. 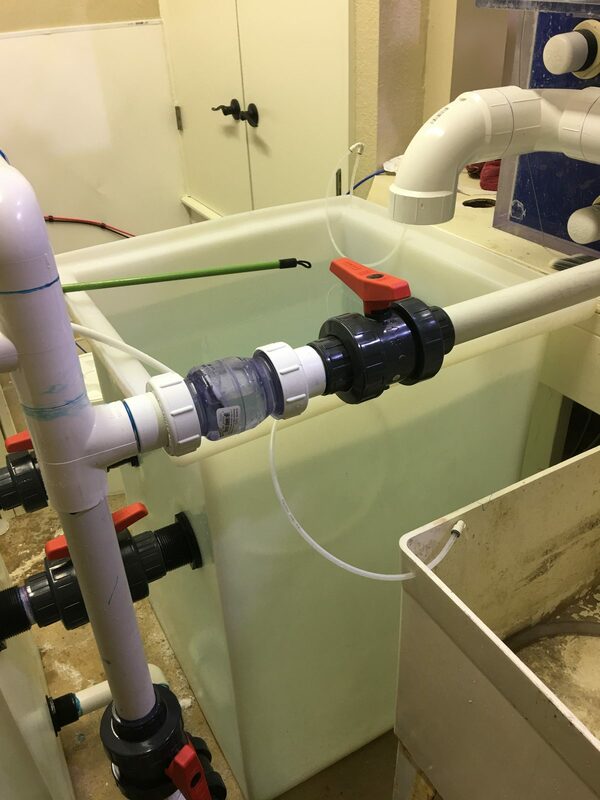 This is the reverse P trap that controls my sump water level and allows the continuous water change. The top P trap opening has holes drilled in it. It’s coming back to life. Should have circulation by this evening. 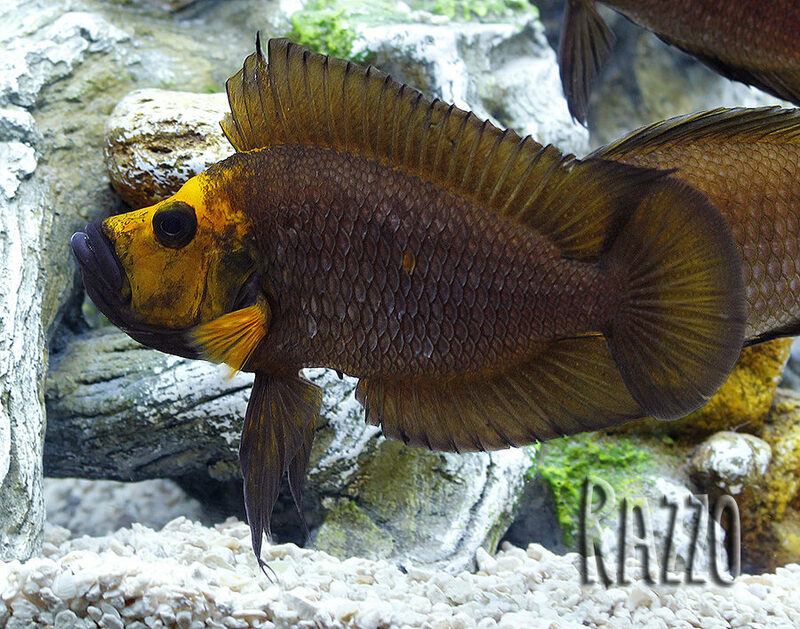 Hate to talk about my African tank more than my NANO but it’s occupied much of my spare time lately. 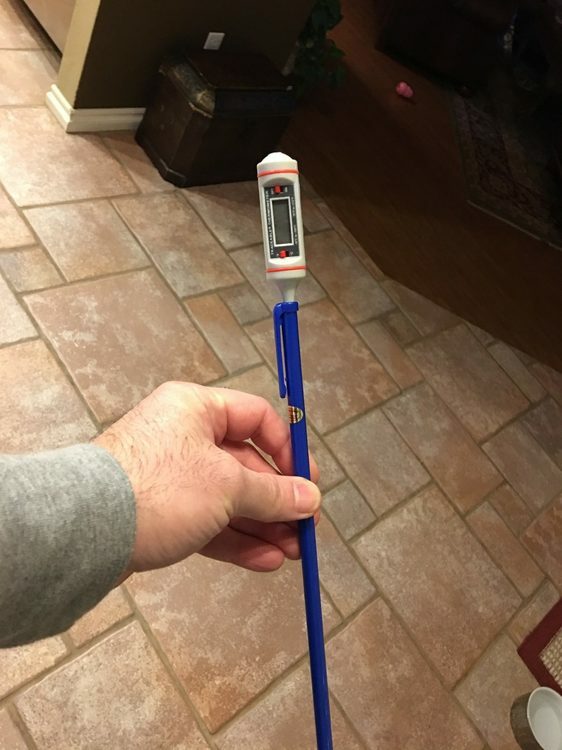 The NANO is running like a top. It’s looking fantastic for such a young tank. Corraline growing everywhere already. 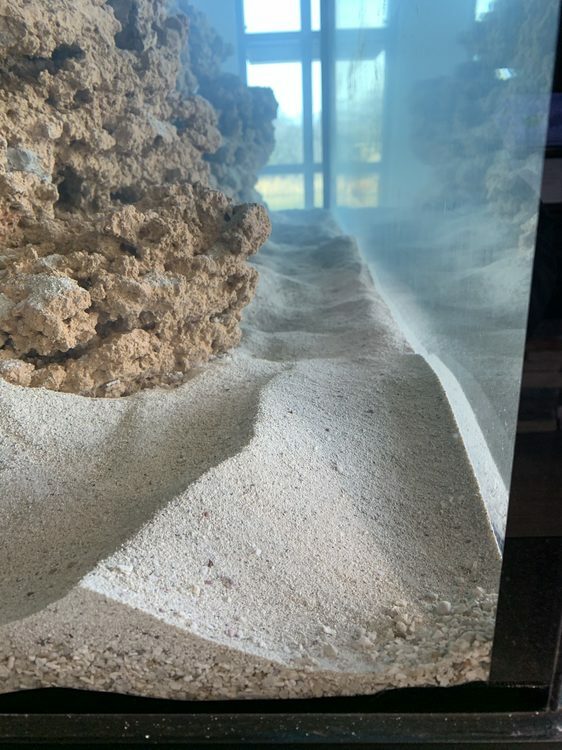 Sand looks pristine thanks to my snails and the busy little pistol shrimp. No real coral growth yet but everything looks happy. Still need to glue down my remaining corals and buy some more for the rack to settle in. As for the African tank. It’s now running. With the new hard plumbing it hums more than before. 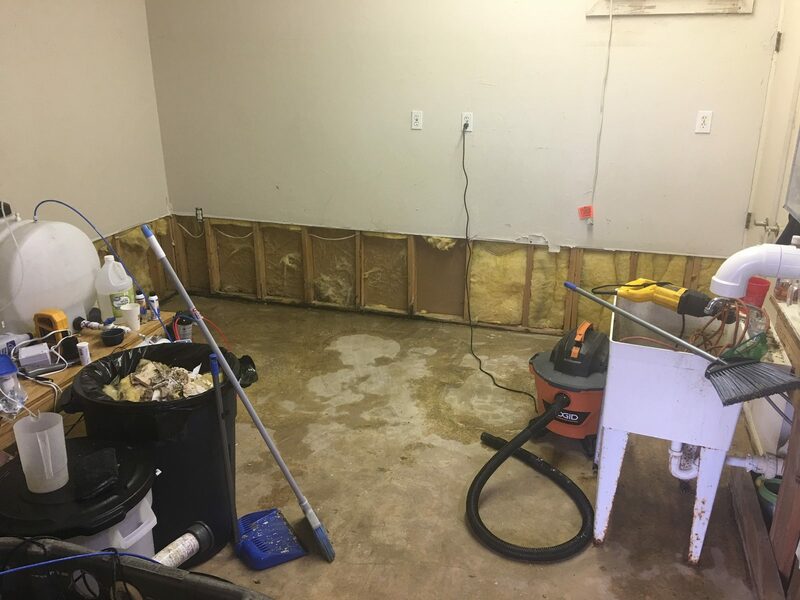 There is also a lot of water noise now that I cleaned out the overflows. 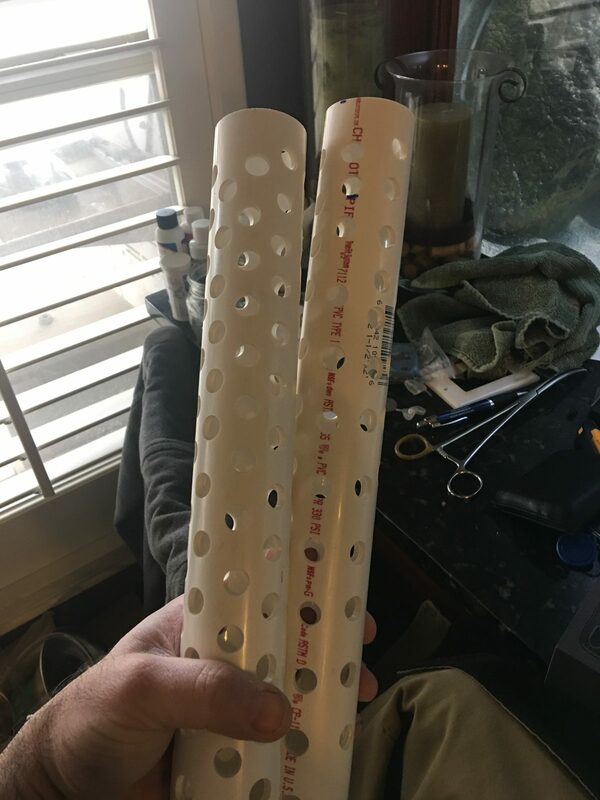 I’ll fix the noise today with some DIY prefilter stacks and install my DIY canister buckets. I’ve began the cycle by adding ammonia and a couple scoops of seasoned media from my temp pond. Curious to compare how fast this goes compared to my NANO cycle. 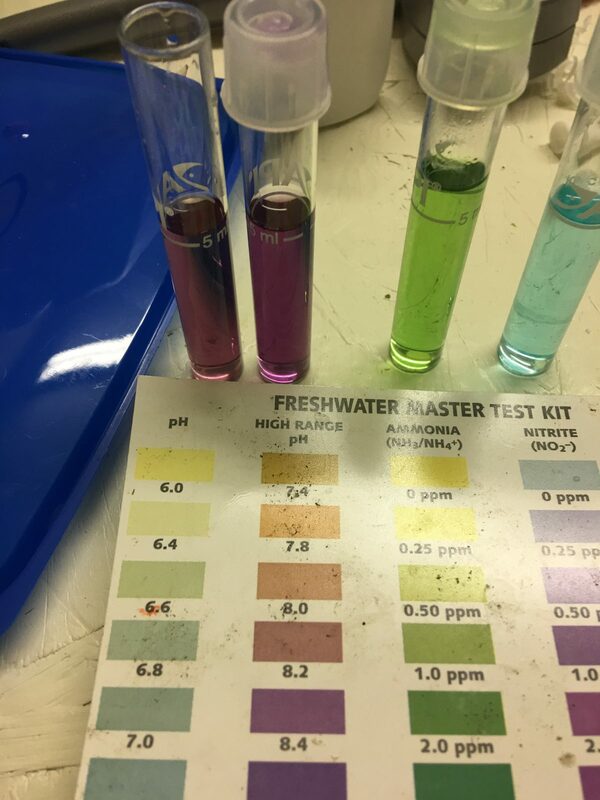 Both from scratch and both fishless with ammonia. 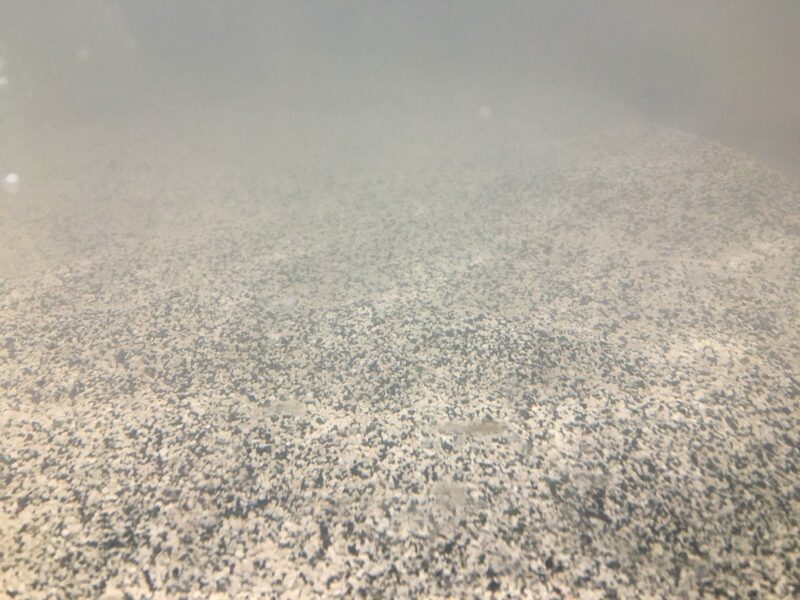 Tank below is a little cloudy from the new sand but not terrible. Once bacteria coats everything it will be crystal. Tub with 150 liters of K1 micro for my bio tub. Initial tests. The two pH test tubes to the left. Number 2 is tank water. pH 8.5-9. The first tube is my tap water before aeriation. It has a lot of dissolved Co2 in it. Bubble a little air through it and pH quickly drops down to same as tank water. 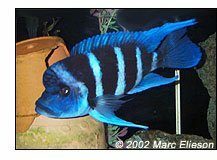 I have no idea how hard it will be to source the exact ones I’m wanting but have several friends that know local breeders. Hope to find out soon enough. My remaining fish in my pond will get a new tank out in the fish room to call home. Not sure yet if I will plumb to the same sump system or not. Probably makes sense to do so. We will see. Hope to see more from the nano reef tank in the future and becomes as nice as the system and techniques behind it, good luck! I also have a very simple salt tank running too. No skimmer, no tech, just a HOB filter ATO and one AI prime light. It’s got only hermits at the moment. It’s ugly as crap but curious how it settles in over the months and years. 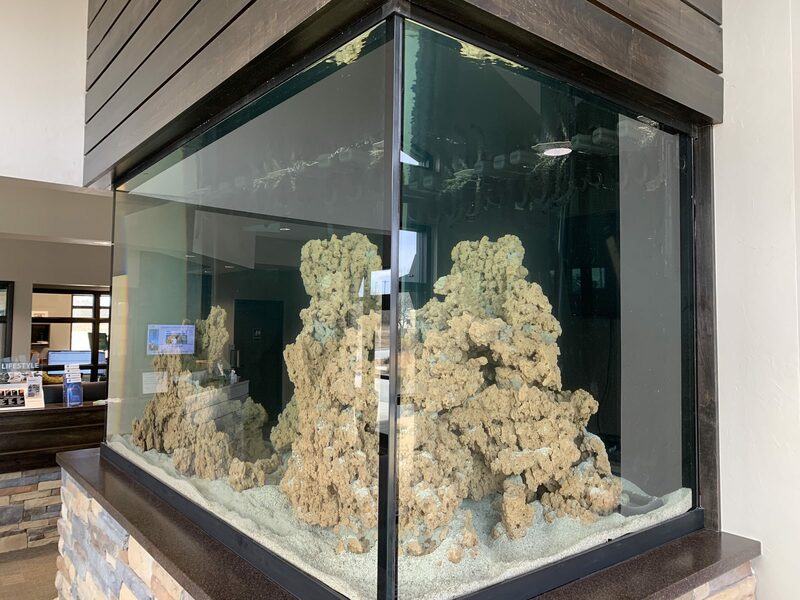 Eventually it will be soft coral and or an anemone tank. 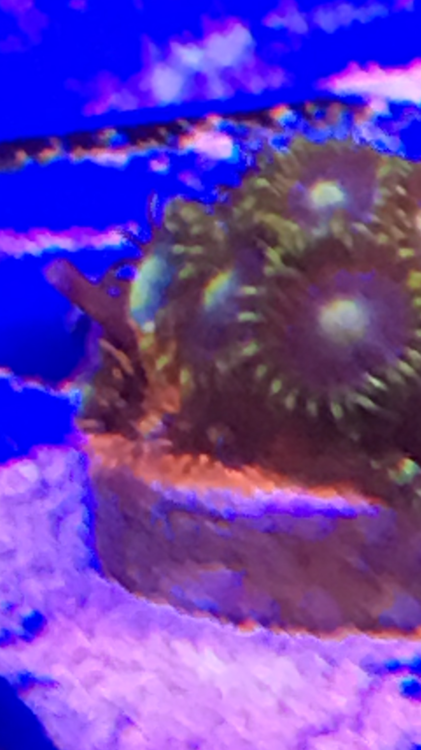 Nano seems to be growing a little more film algae last week or so. Rocks still look great. I’ll check my Nitrate and phosphates again to make sure there is no trends. 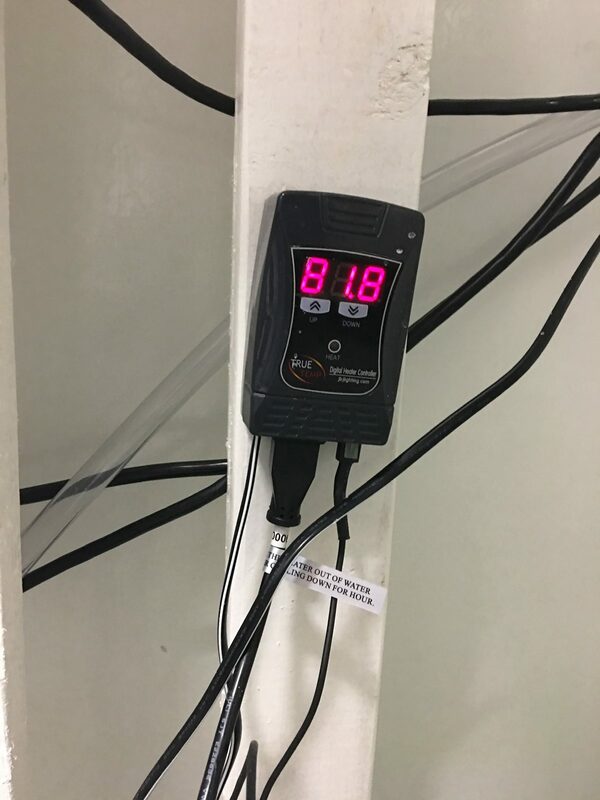 I’ve re instituted my auto water change setup this week so should see slow improvement there. Don’t wanna zap these elements completely to zero like before. As for the African tank, Water noise is controlled. Hum from the pump seems less. Tank running and clearing up. 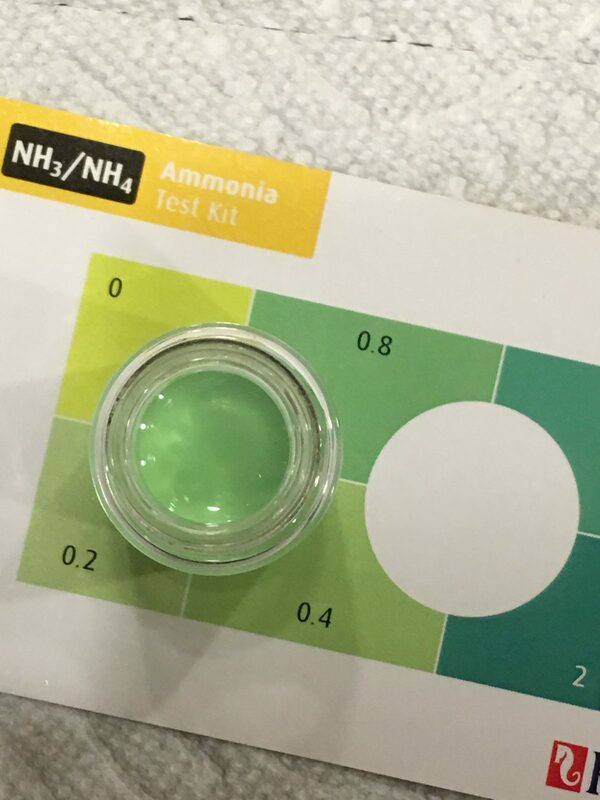 No processing of ammonia yet after two days. Figure there is plenty of bacteria to get the ball rolling for a cycle so just waiting. 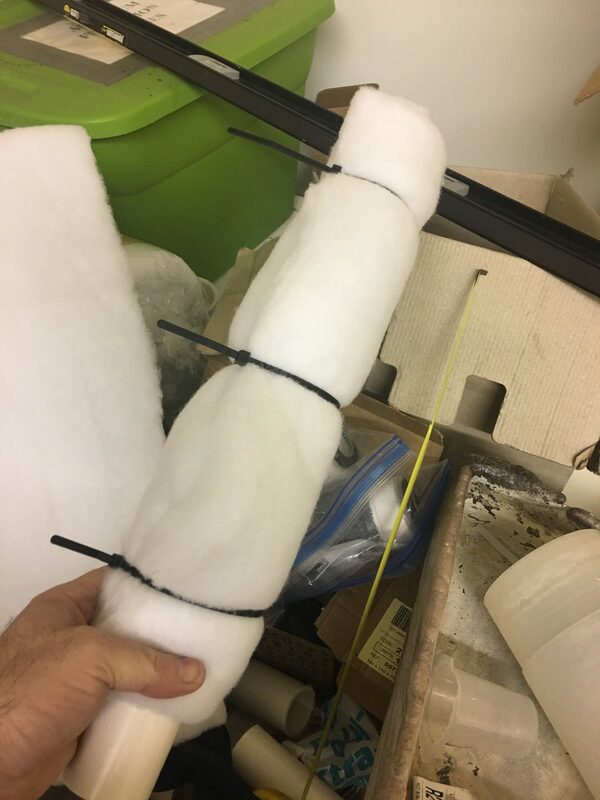 Prefilter stalks wrapped in quilt polyester batting. Buckets with batting for final polishing. Similar technique I used on my old setup. Biggest difference is the biological filter. 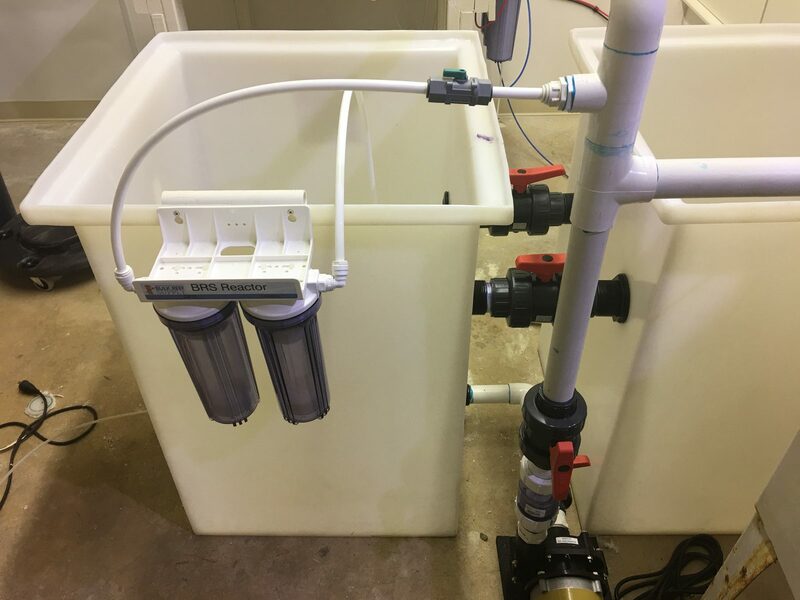 Before was a DIY wet dry filter with old school bioballs. 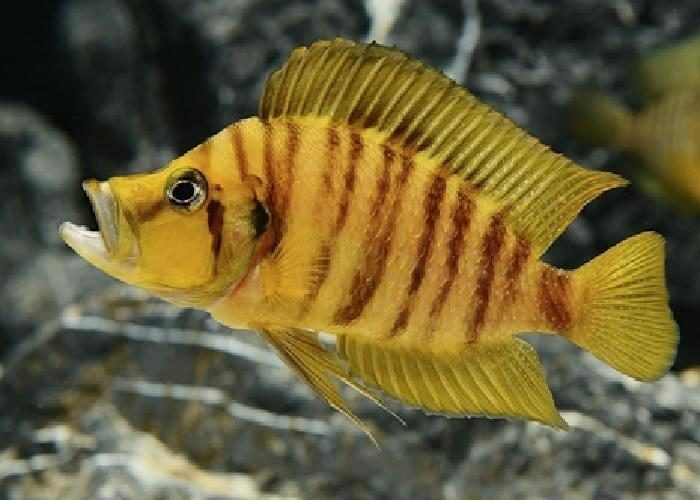 They were getting clogged up, water channeling, encrusted with minerals from the very hard alkaline water these fish require. I hope this new filter is much better. Will see.